I have been blogging about the history of Schaghticoke since July 2011, mostly chronologically, and ,with some detours, have reached about 1840. At that point, we can see elements of our modern town, together with holdovers from its colonial past. The town had a population of 3,400, not that different from now, as the town was smaller physically. The southern border of the town was the Deep Kill, which crosses route 40 at Grant’s Hollow. The population skewed young, with 1315 people under 21 and only 129 over 60. 2% of the population, or 76 people were free blacks. 28 of them lived in fifteen families, with the rest living one or two apiece as servants in various white families. I will write about the black families later. The town government of 1840 was similar in some ways to that of today, with a supervisor, town clerk, and town justices. But there were no town councilmen. There were a couple of election inspectors, four assessors, and a commissioner of highways, similar to today, but there were 32 highway overseers, as men were in charge of maintenance of the road abutting their land. The town also had a couple of poundmasters, as one of the problems in town was animals getting loose and harming crops. Early town laws mandated when cattle could be “free commoners,” in other words, run free. In 1842, the law read that hogs could never be free commoners, but cattle were from May 15 to October 15. The town also had its own sealer of weights and measures and overseer of the poor, both functions done by state and county governments now. There was only one town meeting per year, versus monthly meetings and other special meetings now. The town also had its own police force, the officers called “constables.” These men were ordinary citizens appointed to fill the positions yearly. In 1844 there were five constables. Town records through the 1840’s show various citizens applying to make new roads. The same thing happens now with a new development, but just less frequently. There already was a lot of the road system that exists now, though the roads were dirt or plank, the main road, route 40, a toll road. The bridges over the Hoosic River, at Valley Falls and Schaghticoke, and the Hudson, at Stillwater, were privately-owned toll bridges. There was a ferry across the river at Hemstreet Park. People traveled by horse, horse and wagon, and on foot for private transportation. Public transportation was by steamboat or canal boat on the rivers and canals, by stagecoach from town to town. Railroads had begun to be built, but hadn’t reached our town yet. The town was divided into fifteen school districts, each with a one-room schoolhouse, with a total of 840 students. Unlike today, the town oversaw the schools, providing part of the funding, but each district had a local school superintendent. There was no public education beyond about 8th grade available in town. A few children of wealthier families were sent to private schools in Troy, Greenwich, Fort Edward, and elsewhere, and fewer went on to college. The census states that only six people were illiterate. I wonder what the definition of illiterate was. I feel that number is definitely less than the reality, just from the wills and documents of the period I have read where people were unable to sign their names, using just an X. As today, there was just one village, then called Schaghticoke Point, grown up around the bustling mills in the gorge of the Hoosic River. There was a small settlement in Grant’s Hollow, where Isaac Grant had an agricultural machinery factory and store. It had a school house, church, and post office. There was another settlement at Schaghticoke Hill, on route 40 just south of where the Tomhannock Creek crosses. It grew up because of the grist, textile, gun powder, and keg mills on the stream, and had a school, church, blacksmith shop, and at least one small store. Where we might have auto repair shops, there were blacksmiths, who shoed horses and repaired wagons and other items made of iron. There were a number of inns, some more like bars, others more like hotels. Sometimes a home would have one room that would be a general store or a tavern. Residents of Schaghticoke had some choice of churches in 1840: Dutch Reformed, Presbyterian, Methodist, or Lutheran. The Catholic Church was founded in 1841. Outside the hamlets, the land was divided into farms, large and small. The farms were divided and bounded by all kinds of fences: stone, rail, board, with gates of all sorts. In the 1840 federal census, 491 people worked in agriculture, 454 in manufacture and trade, and 16 in commerce. Some of those in manufacture and trade were women, but this census lists only the names of the heads of household and numbers of people in the occupations, so it is possible to tell only by inference. For example, if three people in a family worked in manufacture and there were only two males, one of the females must have been working in a mill. The same would be true for female farmers, of course. I had always thought about 19th century Schaghticoke as an agricultural community with a little industry, but this even division of occupations proves that wasn’t so. I have written before about the industrial revolution in Schaghticoke. 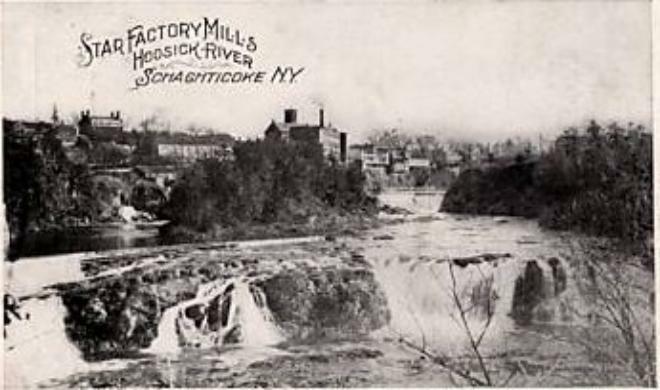 Besides the mills listed in Grant’s Hollow and Schaghticoke Hill, there were textile, saw, and grist mills in the gorge of the Hoosic River at Schaghticoke, and at the falls between Schaghticoke and Valley Falls. There were also seasonal flax processing, saw, cider, and grist mills on the Tomhannock Creek and other small streams throughout the town. The census also listed nine “learned professors and engineers” in town, and in a connection to the past, five Revolutionary War veterans. I thought it might be interesting to learn a little about those folks. I’ll begin with the Revolutionary War vets. They were Peter Ackart, 84; Elisha Phelps, 82; Nathaniel Robinson, 82; John L. VanAntwerp, 80; and John Welch, 77. By the way, there were only six men over 80 in the whole town, and four of them were Rev War vets. All I can find out about John Welch is that he was the head of a household, probably including his wife, plus 1 male aged 20-29, one female aged 10-14, and three females aged 15-19. They young people are young enough to be grandchildren rather than children. As the household includes four people working in manufacturing and trade, this means that at least two of those people were women, if John was still working, if not, then three. I also know very little about Elisha Phelps. His wife was Clarissa Phelps. She was a sister of Dr. Ezekiel Baker, the prominent local doctor until his death in 1836. According to Ezekiel’s probate file, they had lived in Cambridge. By the 1840 census, Clarissa had died, and Elisha was living with Freeman Baker and his family. I am not sure how Freeman was related to the many other Bakers in town, but I don’t think Elisha and Clarissa had any children, so he was probably a nephew or great-nephew. The family included 1 male under 5, 1 26-29, 1 30-39, Elisha, and 1 female under 5, two from 5-9, and 1 from 20-29. Two people worked in agriculture, probably Freeman and the other young man. There is an Elisha Phelps in the pension roll for NY for 1833, but I have not found his pension file online. Nathaniel Robinson, 82, lived in town with just his wife, Susanna Hamblin, as of that 1840 census. However, his son Samuel, born in 1809 here in Schaghticoke, lived next door, with a large family, so at least the old people had some support. According to his pension application, Nathaniel was born in Peekskill in 1759 and enlisted there in 1777 as a member of a Connecticut regiment of the line. This means he was in the regular Army rather than the militia. He was a full-time soldier, while militia men were only called out as needed. His commanding General was Anthony Wayne. Nathaniel was in the battles of Germantown, Monmouth, and Stoney Point, serving for three years. He was wounded in the leg at the battle of Monmouth, and apparently was lame for life. I first find Nathaniel in the census for Schaghticoke in 1810, though by the evidence of Samuel’s birth in 1809, he had arrived a bit earlier. Ancestry.com family trees indicate Samuel was the youngest son of a large family. By 1819, at age 61, Nathaniel applied for a pension. He was fortunate to have the help of local resident and first judge of the county Josiah Masters. Masters added a note to the application saying, “I am personally acquainted with Nathaniel Robinson and he is very poor and in want of assistance from his country. Indeed both his revolutionary service and poverty is (sic) a matter of common notoriety in this part of the country.” Nathaniel was awarded $8 per month, about $150 per month today. At the time, his two youngest children lived with him and wife Susan. They were Sally, aged 15 and Samuel, aged 10. As part of the pension application, Nathaniel submitted an inventory of his possessions. He didn’t have to include his bedding and clothes as they were considered essential. He had no real estate, but had vegetables in a hired garden worth $10. He had a 12-year-old cow worth $15, three pigs worth $6, four chickens worth 50 cents, one axe, one hoe, two pails, one iron kettle, four knives, three iron spoons, one pot and a tea kettle, one basin, three bowls, two jugs, one bottle, one tumbler, one churn, one griddle, three cups and saucers, one small spinning wheel, one loom, two shuttles, one broom, two baskets, one shovel and tongs, four plates, one spider, and one iron crane. A spider is a frying pan with legs, for use over an open fire by placing it on a crane. The total value was about $50, and Nathaniel owed about $60. The Robinsons must have led a very basic existence indeed. perhaps Mrs Robinson made a bit of money spinning yarn. Nathaniel died in 1843, wife Susanna the following year. They are buried in the Brookins Cemetery, on the west side of Route 40 in the Melrose part of town. I am sure they lived in that part of town. Three wives of Samuel Robinson are buried there as well. Samuel lived on in the area until his death in 1891. He is buried in Elmwood Cemetery. The last two Revolutionary War veterans in the 1840 census had actually been members of the local militia, the 14th Albany County. Sylvester’s “History of Rensselaer County,” published in 1880, records Peter Ackart as one of the few Revolutionary War veterans remembered by residents to that day. I find this ironic, as I have been able to find out so little about him in the public record. He was definitely born here, probably the son of another Peter Ackart. I feel he was the Peter Ackart, Jr., who was born in 1767. He was a very young soldier, and served with his father in the 14th Albany County Militia. I have found him in the local census from 1790 until his death. As of 1803, he had real estate worth $948 and a personal estate of $157. He was a farmer, and probably lived in the area just to the north of Stillwater Bridge Road, where several Ackart families lived in the 1850’s. This Peter married Maria Benway, a local girl, born in 1789. Their first child, David, was born in 1807. The couple went on to have seven children in total baptized at the Schaghticoke Dutch Reformed Church, the last in 1826. At least two died young. Peter died in 1845. His tombstone is in Elmwood Cemetery. He must have been buried elsewhere first and reinterred as the cemetery opened in 1863. The 1855 census lists the families of three of his sons: David, Jacob, and John, who all lived next door to each other. Peter’s widow Maria, then 66, lived with Jacob and his family. She died in 1866 and is also in Elmwood Cemetery. So this wife of a Revolutionary War veteran survived through the Civil War. No wonder locals remembered her husband Peter as a vet of the earlier war when Sylvester wrote his history. John Lewis VanAntwerp, 80, was the final Revolutionary War veteran listed in the 1840 census. He was also listed in Sylvester’s “History” as a known veteran. He lived with one of his sons, Peter Yates VanAntwerp. John was born in Albany in 1760, but moved to Schaghticoke by age four. He enlisted in the local militia regiment in March, 1776, another very young soldier. He served off and on until 1780, rising in the ranks as Ensign, Corporal, and Sergeant, and according to one record, to Lieutenant. When the war started, the Colonel of the 14th Albany was John Knickerbacker, prominent local man. In 1778 John VanAntwerp married Catlyna Yates, daughter of Peter Yates, in Albany. Peter and his family had moved recently to Schaghticoke, and he became the Colonel of the 14th after John was wounded at the battle of Saratoga at the end of 1778. So John L. VanAntwerp must have been quite a guy, becoming an officer and marrying the daughter of the new Colonel before the age of 20. In his pension application, John described his Revolutionary War service. He served until 1780, “employed in watching and pursuing hostile Indians at Schaghticoke and Stillwater.” He also marched to Lake George, Fort Edward, Fort Ann, and Whitehall. About October 1, 1777, he was part of a company attached and volunteered to General Gates, in Camp at Stillwater. He was there until the surrender of Burgoyne. In 1778 he guarded different forts on the northern frontier. At one point he marched to Fort Ticonderoga to look at British shipping. This matches what I have read of the experiences of quite a few other local men. They served a month to six weeks each year of the war, as needed. John and Catlyna had a number of children. Five were baptized in the Schaghticoke Dutch Reformed Church, starting with Alida and ending with Peter Yates in 1794. Catlyna’s father, Peter Yates, the Colonel, died in 1808. He was a wealthy man with a number of children. Catlyna received household items from his estate, plus a silver table spoon, a silver ½ pint cup, a mare, a cow, and a bushel of salt. She also received 200 acres of land in Montgomery County, and 100 pounds. Unfortunately John does not appear in the early New York State assessment rolls, from 1799-1804. I would love to know if he used his wife’s inheritance well. What happened to the property in Montgomery County? I feel the family lived in the area north of Stillwater Bridge Road, near the Ackarts. John was a farmer. Catlyna died in 1810, not long after her father, leaving John as a widower with several teenage children at home. When John finally applied for a pension, in 1832, he seemed to have to go to very great lengths to prove he had been a veteran. This would seem ironic for the son-in-law of the Colonel of the Regiment. Herman Knickerbacker, son of John, former Congressman, and judge of the county, testified on his behalf, along with the pastor of the Dutch Reformed Church, Peter Ackart, and Wynant Vandenbergh, who with his father tended the ferry over the Hudson River at Stillwater during the war. Wynant said he had seen John take the ferry on many occasions while on duty during the Revolution. Despite all this support, John was dropped from the pension rolls for a couple of years. Job Pierson, another local former Congressman and judge, helped John re-apply and obtain his pension again, in 1837, at which point he was owed $320. When John died in 1848, he left two sons, Peter and John, and two daughters, Sarah and Maria. John and Maria died by 1851, but Peter and Sarah continued to receive their father’s pension. As of the 1855 census, Peter, then 61, was a farmer with wife Mariah and five daughters. He and Sarah both died in 1860. He is buried in Elmwood Cemetery. So the 1840 census lets us know quite a lot about most of the oldest residents in town. We find that they were well-known in the community. The most prominent residents were ready to speak up for them and the veracity of their life stories. One of them was a destitute old man, despite living near his son, but the others were at least able to live comfortably, and all had family nearby, if they didn’t live with them. The family genealogy describes Simon in glowing terms. As I have found with many prominent men of the era, he was active in all aspects of the life of his community: financial, political, and religious, as well as professional, as a doctor. He began his career as a teacher in the local school in Millertown at age seventeen. He joined the Methodist Church about the same time. Unlike the other doctors in the census, he studied medicine with several local doctors, rather than going to college. He apprenticed a year each with Ezekiel Baker, the uncle of the Ezekiel Baker in the 1840 census, David Doolittle, Nehemiah King, and John Hurlburt. He volunteered with the local regiment for the war of 1812, though the men never got to fight. In addition to being a doctor, he was the first postmaster at Johnsonville, a justice of the peace for 27 years, the town supervisor in Pittstown for three years, U.S. assessor for two years, plus town clerk, commissioner of deeds, and overseer of the poor. He was described as being a stern man of firm decision, great integrity, and unpretentious dignity. Zachariah Lyon was the second doctor in the 1840 census. He is mentioned in several 19th century histories of Rensselaer County as an early doctor in town- but without elaboration. I have pieced together his biography from census and a couple of newspaper articles. He first appears in the local census in 1830, with a family of five, including two immigrants. Presumably the count included him, his wife, Sarah Lavinia, daughter Anna, and perhaps two servants. The 1855 census indicates he and Sarah had been in town for 27 years, which would put their arrival in 1828. That census lists Zachariah as 62 years old, born in Connecticut. Sarah, 65, was born in Vermont, as was daughter Anna, 40. She was born in Sunderland, Vermont, a small town in southwest Vermont. This would indicate that the Lyons moved here from Vermont when Zachariah was 34, Sarah 35, and Anna 13. All of the other censuses indicate Zachariah was born in Massachusetts. Presumably Zachariah came to town as an experienced physician, having practiced in Vermont. Zachariah had arrived at a good time, businesswise, as the established doctor, Ezekiel Baker, was elderly, and died in 1836. In 1837, he and Baker’s nephew, another Ezekiel and doctor, were the two doctors called to examine murder victim Herman Groesbeck, to determine the cause of death, an indication that he was firmly established here. As with Simon Newcomb, Zachariah was involved in politics. I found him as a delegate to the local Whig conventions in the 1840’s. He was the town supervisor of Schaghticoke in 1854. He was also involved with his church, as one of the founding vestrymen of the local Episcopal Church in 1846. During the Civil War, the government imposed new taxes, and these showed that Zachariah paid 12 cents in tax for four pieces of silver- presumably silverware- plus $1 each for two one-horse carriages. He paid on income of $235 in 1864. To me this indicates a comfortable but not wealthy family. The census consistently shows one household servant. At least one carriage would be necessary for his job as a doctor. Daughter Anna appears in the census with her parents in all but one census. Sometime between 1855 and 1860, she married Embree Maxwell. He was a farmer from Saratoga County, just a couple of years older than her father. He died in 1863 and is buried near the Quaker Meeting House in the town of Saratoga, according to an article in “The Saratogian” in 1940. Anna and Embree had a child, Frank, probably about the time his father died. The 1865 census found Anna back with her parents, with Frank, aged 1 8/12. The family was together for the last time in the 1870 census, which listed Zachariah as 78, with an estate worth $18,000, still working as a physician. Sarah was 80, Anna, 52, and Frank 6. Sarah died in 1872, and Zachariah in 1873. This left daughter Anna as his only heir. She received his house and lot plus the income from the rent of a brick store, sheds, and a yard next to his home. This indicates he had lived in the village of Schaghticoke. The Lyons are buried in Elmwood Cemetery. Frank died at age 13, and Anna died in 1892 of tuberculosis. Both are in Elmwood as well. I would love to find out where Zachariah was born, where he was educated, how they ended up in Schaghticoke, how the couple felt when their only daughter married an elderly Quaker farmer, how they felt when they finally had a grandchild. The third doctor in the 1840 census was Ezekiel Baker. Researching him has caused me all kinds of frustration. At this point, I think that there were three men by that name in Schaghticoke in the first 35 years of the 19th century. The eldest Ezekiel was been born about 1730 in Connecticut. An ancestry.com researcher says he was here as of the 1790 census, with a family of 2 males over 16 and 3 females over 16, but moved on and died in Herkimer County in 1800. His son Ezekiel was born in 1761, and travelled with the family to Schaghticoke, but stayed on, as did his son Truman. I don’t have any way independently of that researcher to be sure of that father and son. But for sure, a man named Ezekiel Baker was in the 1790 census, and then in the 1800 census, Ezekiel shows up with a family of one male from 10-16, 2 from 17-26, one from 27-44, one female under 10, 1 from 17-26, and one from 27-44. I’m not sure who all of those people were, as this Ezekiel and his wife Rhoda had no children. Ezekiel Baker was also one of the first school commissioners of the town, before 1800, and one of the organizers of the Homer Masonic Lodge in 1799. The Ezekiel Baker of the 1800 census was a doctor. As of the 1803 NYS assessment, he had real estate of $1950 and a personal estate of $257. That same year, he was one of the founders of the Schaghticoke Presbyterian Church and an original trustee. This church was founded by the incoming New Englanders to town, and was THE church of the local mill owners, movers and shakers. When the church was reorganized in 1820, Ezekiel was still a trustee. He purchased pew 18 for $33. Pew purchase and rent was the way the church was financed. Ezekiel continued to be a pillar of our community until his death in 1836. The more I look at early deeds for the town, the more land I see that he owned. For example, the 170 acres of the current Howard Gifford farm was sold by Ezekiel to Josiah Masters before 1815.Of course he continued to appear in the census. Interestingly, in 1810 and 1820, his family included one female slave. I would love to know why Ezekiel and his wife purchased a young black girl (she was from 18-26 in the 1820 census). She remained with the couple in the 1830 census, though by then, of course, she was free. The probate file of Ezekiel listed his many heirs: his brothers Lyman, Truman, and sisters and their many children. The most important one for us is Ezekiel, a son of his brother Truman. Ezekiel stayed on in Schaghticoke. I’m sure that to avoid confusion, he was always known as Ezekiel 2nd. to differentiate him from his uncle. He was the doctor of the 1840 census. Incidentally, that census entry includes one free black woman of the age to be the same who had been his uncle’s slave. Ezekiel Baker 2nd was born in 1795 in Pittstown. He attended Williams College from 1810-1814, and was listed as M.D. in the class of 1810, though apparently he did not graduate. Perhaps he mentored with his uncle Ezekiel to become a doctor as did Simon Newcomb, another of the 1840 census doctors. According to Anderson’s “History of Rensselaer County,” he was a local doctor for fifty-one years. Ezekiel picked up right where his uncle left off, becoming a pillar of the Presbyterian Church. He was secretary of the meeting when it reorganized in 1831, was a clerk of the trustees for many years, and first president of the Sunday School. Ezekiel was also involved in local politics, attending Whig conventions in the county. He ran for state assembly and county coroner in the 1840’s and 1850. Anderson states that he was a strong abolitionist, and that his home was a stop on the underground railroad in the 1850’s. And he got involved in business matters as well. Apparently he was one of a group of investors who held the mortgage on extensive mill properties of Ephraim Congdon on the Hoosic River. Ephraim defaulted in 1834, and the investors sold the property at auction. Ezekiel was married to Harriet Bryon Bryan of Schaghticoke. They had six sons. David Bryon Baker, born in 1821, attended both Union and William Colleges. He was a doctor, but also town clerk of Schaghticoke as a young man, in 1843-1844. I’m sure he was tapped to be his father’s successor as town physician, but he died in 1847. He was married to Jenette C., and they had two small children. One of them, Calot, lived with his grandparents for a number of years. The Baker’s second son, Charles, was born in 1823. Charles became a general merchant, and worked for local mill owner Amos Briggs. He was in business in Schaghticoke until his death in 1896. Third son Robert was born and died in 1825. The fourth son, Lorenzo Dow, was born in 1826. Though he became a merchant like brother Charles, he was also a tailor and concentrated on selling clothing. He must have been a bit more outgoing than Charles, or maybe more successful, as he rated a biography in Anderson’s “History of Rensselaer County.” Thus I know that he attended both the Greenwich, NY, and Manchester, Vt. Seminaries- the equivalent of high school- and then went on to work in Troy for a few years. Lorenzo returned home to become a clothing merchant and tailor in the village of Schaghticoke for the rest of his life. He was also the town clerk in 1853-54, and held various positions in the government of the new village of Hart’s Falls (Schaghticoke) after 1867, as did brother Charles. Lorenzo was very successful, building the Baker Opera House about 1875. It had retail spaces on the first floor- including his own and his brother’s- and a theater upstairs, and was located where Sammy Cohen’s is today. Unfortunately it burned in a huge fire in 1880. Lorenzo survived until 1904. Fifth son William Henry was born in 1829. He was listed in the 1850 census for Schaghticoke with his parents, and brothers Lorenzo, and John as a merchant, age 21. By the 1855 census he was gone, probably to Racine, Wisconsin, where he was listed in the 1860 census as a bookkeeper, with wife Mary and two small sons. He died before 1866, as he was listed in his father’s will as deceased. 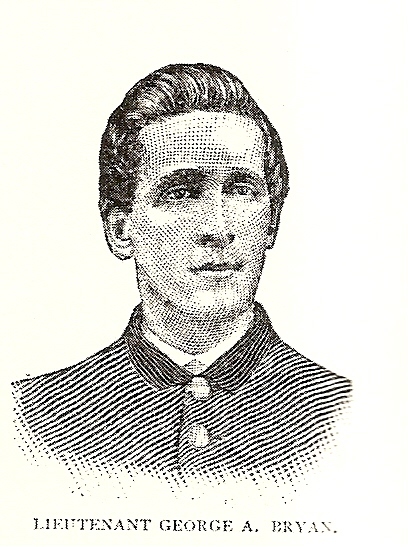 Youngest son, John Ezekiel, was born in 1831. Though John studied medicine at Williams College, he also attended Union Theological Seminary in 1858 and became a Presbyterian Minister. I wonder if there was pressure for John Ezekiel to become a doctor as his oldest brother David Bryan had died. If so, John evidently persisted in the career for which he felt called. He moved to Rochester, where he was a minister and prominent member of the community, living until 1894. Father Ezekiel lived until 1866, long enough to see the death of two of his sons, and the success of the rest. Widow Harriet survived until 1872. All of the Schaghticoke Bakers are buried in Elmwood Cemetery. Returning to the 1840 census, it also included three ministers in the list of “learned professors and engineers.” They were Hugh M. Boyd, Hawley Ransom, and J. H. Noble. I will begin with Hawley Ransom, as I know the least about him. He was born in Vermont in 1809. According to Sylvester’s “History of Rensselaer County,” he was an original member of the Troy Conference of Methodist Ministers in 1834, at which point he was serving at Schaghticoke Hill. That is the little community on Route 40 just south of where it is crossed by the Tomhannock Creek. Hawley served as the justice of the peace in the town of Schaghticoke in 1843.He and wife Lucy moved to Northumberland in Saratoga He must have felt quite a tie to the place, as when his first wife, Lucy, died in 1858, he had her buried in the little cemetery next to the church, even though he had moved to Northumberland in Saratoga County. The couple had stayed in Schaghticoke for a long time- at least from 1834 to 1855, as the 1855 census for Northumberland states that Hawley and Lucy had lived there for just two months. Oddly, Hawley, now 50, was listed as a shoemaker. Wife Lucy was also 50 and their two daughters, Margaret, 24, and Drucilla, 15, lived with them. By the 1860 census for Northumberland, Lucy had died, and Hawley had remarried Catherine Strong. Hawley was again listed as a clergyman. He and Catherine, 35, lived with Abby, 20- presumably Drucilla called by a different name, and Harriet Strong, 40. She was Catherine’s sister, a milliner. The 1865 census shows the birth of a daughter, Josephine, to the couple, then 11 months old. This census lists Hawley as both farmer and minister- and this was probably the case in the censuses where he was listed as a shoemaker and farmer alone. Hawley died in 1873 and is buried in the Reynold’s Corners Cemetery in Moreau. Wife Catherine died in 1896 and is there as well. Hugh M. Boyd was probably born in Schenectady in 1795. He graduated from Union College in 1813. He is listed in a book of the graduates of Union as a clergyman from Schenectady. As would befit a man from very Dutch-oriented Schenectady, Hugh was a Dutch Reformed minister. I don’t know where he was from 1813 to 1830, but I think he was in Saratoga as of 1830, based only on a census listing. Hugh was the pastor at the Schaghticoke Dutch Reformed Church from 1835-1841. During that time he and his wife Mary Dorr had two daughters. Margaret was baptized in 1835 and Martha was born in 1836 and baptized April 30, 1837. This was a time when the church, the oldest and once the largest congregation in town, was shrinking. He did marry 23 couples during that time, including one black couple, and baptized 25 children. After he left in 1841, it was seven years until another baptism was recorded. I don’t know where Hugh went after he left Schaghticoke, but he died in 1847 at age 52 and is buried in Vale Cemetery in Schenectady. The third minister in the 1840 census is Reverend Dr. Jonathan Harris Noble, known in the records as “J.H.” He was the minister at the Schaghticoke Presbyterian Church from 1837-1869. He was born in Vermont in 1804, the son of Obadiah, whom I think was also a minister. Jonathan was a graduate of Williams College in 1826 and the Princeton Theological Seminary in 1829. I’m not sure where J.H. was in the years before he came to Schaghticoke, though his interment record states he was in Tinmouth, Vermont at some point, but he arrived here as an experienced minister. This was good for the church, as it had been suffering through schism in the previous ten years. J.H. brought stability. Unlike other prominent local men, J.H. stuck to his job, not getting involved in politics. This included participating in the larger Presbyterian synod and the national home and foreign missionary societies. Mrs. Noble participated as well. I found her listed in several publications of the American Tract Society in the 1840’s, for example, which published the pamphlets used by foreign missionaries. That 1840 census includes J.H., and his wife Octavia, plus one other female aged 30-39, probably her sister Emily, plus one female age 10-14, presumably their daughter Mary Louisa. The 1850 census shows Jonathan, then 46, with his wife Octavia Porter, 43, her sister Emily, 50, and their mother Aurora, 85. I don’t know where Mary Louisa was. She appears in the 1855 census, aged 22. She had joined her father’s church the year before. Emily and Amanda Porter continued to live with the family. Johnathan also appeared in the 1855 NYS census as a farmer. He had twenty improved and ten unimproved acres worth $4000. He had grown seven acres of oats, two acres of corn and ten acres of potatoes the preceding year. He had 23 fowl, one cow, and one pig. So he primarily grew what his family needed. Mary Louisa was also left out of the 1860 census, when J.H. and Octavia lived just with a servant, and in 1865, when the church records indicate she moved to Elizabeth, New Jersey. Around the same time, in October 1865, the Albany Presbyterian Synod held its meeting in Schaghticoke. This must have been a real feather in J.H.’s cap. Unfortunately, his wife was ill and dying at the time. An article in the Troy “Daily Times” records that J.H. was amazing, being the good host of his fellow ministers while tending to his ill wife. Octavia is buried in Elmwood Cemetery. J.H. remarried, to a woman named Caroline, by November 1866, when she joined the Presbyterian Church. The minutes of the Presbyterian Church session reveal that Rev. Noble proposed to resign in fall 1868. It took until the following June to find a replacement. This is reflected in the 1870 census for Schaghticoke, when J.H., now 65, and wife Caroline, 45, were living in the inn of Garrett Groesbeck, rather than in the brick manse. But J.H. did not retire. He went to Johnsonville by 1871. The Presbyterian Church had begun there in 1856, but I found J.H.’s name in a Presbyterian record of home missions in 1874. I’m not sure why the assignment in Johnsonville would be considered a mission, when it was already established. I did not find the Nobles in the 1880 census, but J.H. was still listed as being in Johnsonville in a newspaper article of 1882. Sometime later, J.H. and Caroline Noble moved to Perth Amboy, New Jersey, presumably drawn by Mary Louisa living in that state, though there was a Ministers’ Home there, for retired pastors. J.H. and Caroline were living there when he wrote a letter to the local Synod, meeting in April 1896. J.H. died later that month. He was buried from the Presbyterian Church in Schaghticoke, with seven fellow ministers taking part in the service. The 1900 census found Caroline in the Westminster Home in New Jersey. She died in 1901. Both are buried in Elmwood Cemetery. Returning to the 1840 census, there were two lawyers among the “learned professors and engineers. I have already written extensively about one of them, Herman Knickerbacker. He is one of the most famous residents in the history of the town. Unfortunately to me, this is because he was the model for Diedrich Knickerbacker in Washington Irving’s “Knickerbocker’s History of New York.” But he was also one of the first lawyers in town, U.S. Congressman from 1809-1811, Rensselaer County judge, and local businessman and mill owner. Virtually every deed involving Schaghticoke in the first forty or so years of the 19th century has Herman’s name in it somewhere, either as the lawyer handling the deal, a witness, or judge. The second lawyer in the census was Nelson Moshier. He was born in 1806 in Dutchess County. He married Catherine Tice of Brunswick in 1833 at Gilead Lutheran Church. He was the Schaghticoke Town Clerk in 1841 and a school commissioner about the same time. I have found Nelson as the lawyer in probate files and wills of the era. By 1850 the family had moved to pioneer in Michigan. According to a biography on the find-a-grave website, he practiced law there and was a circuit court judge, and the first prosecuting attorney when Isabella County, Michigan was formed. Nelson died in 1872 and is buried in Isabella County. I would love to talk to Nelson about his motivations for moving West. It was certainly becoming more and more common at the time. So now I’ve written about some of the more prominent people in town. How about the others? Let me turn to the nine black families. New York State’s gradual abolition of slavery had ended in 1829. While there were 343 blacks in Schaghticoke in 1790, by 1820 there were 66 slaves and 30 free blacks, and by 1830 there were just 52 free blacks. The total of 76 in the 1840 census is actually a bit of an uptick. In a few cases, freed slaves stayed on in the families where they had been owned. For example, the elder Dr. Ezekiel Baker had had one female slave in 1820 and had one freed black female in 1830. The nine black families in the 1840 census amounted to just over a third of the blacks in town. Interestingly, none is listed with an occupation, though they certainly all worked! As you will see, in most cases I was unable to find out much, if anything, about the families. This is partly because they were often illiterate, they were not taxed, and were not active in politics. They also moved a lot, and lived in poor circumstances. They just weren’t much in the public record. The heads of household of these black families were Thomas Mando, Prince Jackson, Peter Williams, Thomas Robins, Peter Baker, James Hornbeck, James Franklin, Stephen Calvin, and Joseph Winney. I do know a bit about one of the families. There is a legend that Thomas Mando, who was listed in the census as over 55, with a female over 55 and one male under 10 in his family, may have been “Thomas Mandolin”, a former slave of the Knickerbacker family. He got his surname because he played the mandolin. What is true is that he and his wife had also been a family in the 1830 census, right after the final abolition of slavery. At that point they had four children living with them. It is possible that the young boy in the 1840 census was a grandchild. The couple was still in the 1850 census: Thomas, 83, and wife Hannah, 60. Thomas still listed his occupation as laborer, and they had a black girl named Margaret Fonda, 8, living with them. One of their sons, also Thomas, and his wife Catherine and family were still in town as well. Their youngest child, Albert, then 4, became a composer and orchestra leader in New York City. I do not know where the elder Thomas Mando and his wife are buried, but the younger Thomas, wife Catherine (Katie), and several children, including Albert, are in the Methodist Cemetery at Schaghticoke Hill. Prince Jackson and his wife were also in both the 1830 and 1840 census. In 1830, he was between 24-36 years old and she, 10-24. In 1840 they were both listed as between 35-55 years old. In 1830, there was a second black Jackson family, that of Richard, with a family of four, but he was gone by 1840. And Prince and wife were also gone by 1850. Prince is a fairly common name for slaves, as was Jackson, so there were a half dozen men with that name in the New York area in 1850. I don’t think any of them was our Prince. So I will have to leave his story there. Peter Williams is another black man who also appeared in the 1830 census. At that time, his family consisted of him, age 24-36, his wife, age 10-24, and a son under 10. The 1840 census listing is similar, with one male 24-36, one female 10-24, but this time one female under 10. There are definitely some issues with the accuracy of their ages. The Williams stayed on in town, and the 1850 census lists them as Peter, 45, a laborer born in New York, illiterate; his wife, Diana, just 23, also born in New York; and their son John, 3. This clearly was a second wife for Peter. That census also included Harriet Williams, a black girl aged 16, who worked for the family of Ormon Doty, and Nancy Williams, a black woman aged 27, who worked for the family of John Groesbeck. They could have been daughters of Peter. Nancy was still working for the Groesbecks as of the 1855 census, though her age was then listed as 41. She was born in Rensselaer County. I did find that Peter and Diana moved to Waterford by 1860. Peter, now 55, and Diana, 28, had a daughter Sarah, 9. Peter was a laborer, with a personal estate of $15. But I could not find them after that. It seems like a number of children passed in and out of the census listing for the couple. It is so difficult and frustrating to trace these people, handicapped by their race and their illiteracy, when we would love to know the whole story. Thomas Robins was the last black man who appeared in both the 1830 and 1840 census. In 1830 his family included two males under 10, and one 36-54- that was Thomas- plus one female under 10, one from 10-23, one from 24-35, and one from 36-54. One of the older women was certainly his wife, but there must have been another woman who was neither child nor wife, plus perhaps three children. By the 1840 census, the family was reduced to just Thomas and his wife, both listed as over 55. There is quite a twist by the 1850 census, when there was a Peter J. Robbins, a black man aged 35, working as a laborer on the Kenyon farm. Peter stayed on in town and served in the Civil War, returning by the 1865 census, when he was now listed as a 55 -year -old laborer, with a wife and young son. Peter could certainly have been one of the sons of Thomas. I cannot find Thomas and his wife for sure elsewhere in the 1850 census, as there are several couples with Thomas Robins as the head of household of the correct age in New York State. Peter Baker was another black man with a family in the 1840 census, though not in 1830. He was aged 24-35, and had a wife in the same age range, plus one daughter under 10. I feel this family had left town by 1850 and moved to Lansingburgh. In that census there was a Peter, aged 35, with wife Susan, aged 33, and daughter Mary, aged 14. I could not find them in the 1860 census, but in the 1865 NYS census, they were in the 1st Ward of Troy. Peter was a coachman, who had been married three times. His wife was now Sarah, aged 43, listed as a mulatto, while Peter was black. She was born in Maryland, and this was her second marriage. Interestingly, a 40-year-old black man named Ebenezer Williams, a barber aged 40, lived with them. Could he have been another son of Peter Williams, our previous subject?? And another black family which had lived in Schaghticoke, the Hornbecks, lived next door. Unfortunately, I can’t find Peter past 1865. James Holenbeck or Hornbeck, also black, had a family of four in the 1840 census. He was from 24-35 years of age, his wife the same age range, plus one son and one daughter under 10. There are graves in the old Methodist Cemetery at Schaghticoke Hill- the same cemetery where the Mandos are buried- for Emeline, died May 8, 1847 age 7; and Henry, died May 12, 1847, age 18, both children of James and Susan Hornbeck. What a tragedy for the family. I feel that they moved to Troy soon after. Though I have not been able to find him in the 1850 or 1860 census, a James Hornbeck is in the Troy City Directory from 1857 on, listed as a porter who lived at 38 Fulton Street. The August 20, 1856 issue of the Troy “Daily Times” reported that James Hornbeck assisted the chairman of a “meeting of colored persons” at the Liberty Street Presbyterian Church in Troy. The meeting discussed propositions for blacks to get to right to vote, among other issues, reporting on a larger convention held recently in Seneca Falls. There is also a Joseph Hornbeck in both the 1850 and 1855 Schaghticoke censuses. In the former he was a 12-year-old black boy, who lived in the family of Nathan Overocker. In the latter, he was a laborer in the family of William Brown. He could have been a son of James. As I mentioned above, I did find James Hornbeck and his family living next door to Peter Baker in Troy in the 1865 census. James, 65-years-old, was a laborer. He had a wife, Susan, age 64, born in Rhode Island, who had had eight children. A black couple, Thomas Moore, 26, born in New Jersey, and Rebecca Moore, 27, born in Saratoga, lived with them. By the 1870 Troy directory, James had died. Mrs. James Hornbeck lived at 119 Church Street. A Joseph Hornbeck lived in Troy as well. This listing for Mrs James is interesting as an obituary in two local newspapers reported the death of Susan Hornbeck in 1864. A post on the webpage of the Lansingburgh Historical Society quotes: “A centennarian with ten years to spare, died at Lansingburgh yesterday. Susan Hornbeck, better known as “Aunt Susan,” was her name. She had attained the age of one hundred and ten years. The deceased was a colored woman—born a slave in Saugerties [Ulster County], and held by the family of John Brown in Lansingburgh for many years—only being released when New York became a Free State.”Schenectady Daily Evening Star and Times. April 9, 1864: 3 col 2. Albany Morning Express. April 11, 1864: 3 col 3. James Franklin and his family also lived in town in 1840. James, aged 24-36, and his wife, aged 24-36, had two daughters, one under 10, one aged from 10-14. He was still here in the 1850 census: James, aged 40, a laborer born in New York, with wife Betsey, aged 28. If the ages are correct, this could be a different wife. What happened to the children? I have been unable to find James after this date. I have been unable to discover anything more than their listing about two of the black families in the 1840 census. Stephen Calvin, a black man aged 36-55, and his wife, the same age, also lived in Schaghticoke as a family in 1840. The last black family in the 1840 census was that of Joseph Winney. Joseph was from 24-35 years old. He and his wife, the same age, had three small sons, under 10 years of age. Unfortunately this census doesn’t indicate foreign born citizens, which would have been helpful to fill out this story of life in Schaghticoke in 1840. I know that the population of foreign born increased rapidly during this period, mostly due to an influx of mill workers and of Irish immigrants. There were enough Irish Catholics here for the Albany diocese to begin a church in 1841. Now that I’ve discussed some of the individual families in town, I’d like to move on to discuss how people lived. Beyond generalities, I will use inventories of their estates from probate files to try to figure that out. The problem with this method is that inventories can be more or less complete, but I can’t think of a better way. In 1840 as now, there would be quite a range of prosperity. Earlier in this article, I gave the inventory of Revolutionary War veteran Nathaniel Robinson, whom we would hope was at the poorest end of the range. He owned no land, possessing just a few animals, a few dishes, and a few cooking utensils. Tellingly, his wife had a spinning wheel and a loom. She could process her own wool and make fabric, either for home use or to sell, impossible to know from the information given. The Robinsons certainly lived simply, cooking their food in the now old-fashioned way, over a fire outdoors or in a fireplace, getting water from a well, lighting with a candle or oil or grease lamp. They grew their own food as much as possible, and lived a simple life with no books, pictures on the wall, curtains at the windows, or rugs on the floor. At the other end of the scale, was Munson Smith, a prominent local businessman and mill owner, who died in 1842. I have written of him before- it’s on my blog at www.schaghticokehistory.wordpress.com. Using the inventory of his estate in his probate file, we can intuit that the Smiths lived in a carpeted home, with curtains at some of the windows and inside shutters on others. A lot of the furniture was mahogany, with matching chairs at the dining table. They had large sets of matching dishes (39 plates in one set!! ), with specialized dishes for gravy, custard, fruit, and other foods. While there was some plain glassware, some was cut glass, and they had specialized wine glasses. Some of the silverware had ivory handles, some was silver. Several bedrooms were furnished with maple, mahogany, and cherry beds, small tables, chairs, and dressers, with a mirror on each wall, and lots of bed linens of different types. This was in the pre-bathroom era, so there were several wash bowl and pitcher sets, for washing in the bedrooms. While there were fireplaces, the rooms were also heated with cast iron stoves, probably set into the fireplaces and using their flues. There were candles on the mantelpieces, but they also had the latest Astral lamp. There were also several clocks. The inventory lists the kitchen stove, plus pots and pans of brass, tin, and iron. The kitchen range with a cook top was a relatively recent advance over open hearth cooking. It may have been either coal or wood burning. Munson’s office was either in or attached to his house. It contained office furniture, plus a bedroom, furnished, and his library of about 60 volumes. This was a substantial library for the time. Munson’s wearing apparel is not itemized in the inventory, but was valued at $21. This doesn’t seem like much, but considering that the kitchen stove was worth $12, it is quite a lot. I’ve been trying to find an inventory of a less wealthy person who was not a farmer to contrast with Munson Smith. This is not easy to do. I did find that of Henry Thompson, who died in town in 1845. He left a widow and five children, two under 21. His widow Sarah stated his “goods and chattels” were not worth more than $250. Henry left one cow and one swine, and there was some basic agricultural material, a scythe, a straw cutter, a potato hook, a plough There was one horse, two wagons, two “cutters”- sleighs, a saddle and harness of different kinds. This would have provided transportation for the family and his business. He also had the tools of a carpenter: a cross cut saw, grindstone, six planes, an adze, chains, a square, five moulding tools, a set of framing chisels, a hammer, a broad axe, a circular saw, a smooth plane and gauge, plus some wood: two sets of boat plans, a lot of birch planks, and another lot of planks. Was he a carpenter who built boats? Henry’s widow retained a wagon, two stands, a rag carpet, a bureau, a table, six chairs, and a looking glass as her widow’s portion. The rest of the household furniture consisted of just four beds with their bedding, two stoves, cooking utensils not detailed, one table, six chairs, six knives and forks plus other crockery, one spinning wheel, and library and school books. I’m glad to see the books, as the rest of the furnishings seem basic to say the most. I did find widow Sarah in the 1850 census for Pittstown. She was 47 years old, born in New York, and had real estate worth $600. In her household were her sons Peter, a 20 -year-old carpenter, Isaac, 10, and Bryan, 6, and a Michael Thompson, 43, born in Ireland, who was a laborer- perhaps her brother-in-law. So I think Henry was a carpenter, and probably an Irish immigrant, who died when his youngest child was just one. She had moved, but not far, and had a place to live. Let’s look at the probate file of John Baucus, who died in 1832 at 59. He was a farmer who lived near the current town hall. He and his family attended the Lutheran Church, and he is buried in the cemetery at the junction of Melrose-Valley Falls Road and North Line Drive. In the 1830 census for Schaghticoke, John, age 50-59, had a wife the same age plus one son from 10-14, two from 15-19, one from 20-29, and two daughters from 10-14. The inventory of his estate gives us insight into a prosperous farm of the period. He had nine horses, seven cows, four young cattle, four calves, and a pair of oxen, plus 50 sheep, 15 pigs, 18 hogs, and one boar, 13 geese, and some chickens. At that time, there was a woolen mill in the village of Schaghticoke, a market for the wool. Turning to farm equipment, John had five ploughs, a fanning mill, two ox carts, three sleighs, an ox sled, three wagons of different kinds, two drags, five pitch forks, two dung forks, four rakes, a patent rake, a stone boat (for moving stones), four hoes, some shovels, and other miscellaneous tools. John also left large quantities of hay, stored in several different barns, 500 bushels of corn, 300 bushels of wheat, “a lot of oats in the barrack,” potatoes “in the hole” and 100 other bushels of potatoes and 15 bushels of buckwheat. A barrack is a temporary barn structure. I feel that potatoes were stored in a hole constructed for that purpose, like a root cellar. John’s widow was allowed to keep items apart from probate that were essential for herself and her “infant children” to live. There were five children in this category. She kept ten of the sheep, one cow and four pigs, plus the only household furnishings included in the inventory. There were kitchen utensils- pots, a brass kettle, a frying pan- plus two stoves, 25 chairs, six tables, and four looking glasses. There were seven beds, 30 blankets, 15 pairs of sheets, and 15 pairs of pillow cases, plus two sets of curtains, two carpets, four other window curtains, eight table cloths, one stand (small table), a wooden clock, and a bureau (dresser). This seems like plenty of chairs, mirrors, and bedding, but too little clothes storage, although there were two chests and two cupboards- but they might have been for food or dish storage. Mrs. Baucus had two sets of dishes, one fine, one every day, two sets of knives and forks, two decanters, six tumblers, and 15 wine glasses. A stove for cooking is not mentioned, though there is a furnace. I am not sure what was meant by that- certainly not what we would think of as a source of central heat. It could have been a stove for heating flat irons. The only lighting implements on the list are three candle sticks, though there could have been various kinds of oil lamps. There were also a churn and a wash tub. The inclusion of a loom, two big and one small- spinning wheels- plus 35 yards of yarn, 44 yards of cloth, and eight pounds of rolls (probably the rolags from which yarn would be spun), suggest household manufacture from the fleeces of those sheep. The family also had two Bibles and twenty other books. To us this would seem like a pretty short list of household goods for a family of eight compared to the extensive inventory of farm equipment, the harvest, and animals, but it was a different time. Elijah Bryan was another farmer in town. He died in 1842 aged 79. His wife had died the previous year. They lived south of Hemstreet Park, probably near where they are buried in a little cemetery near the junction of River and Pinewoods Roads. While his inventory presumably reflects that of a couple mostly retired from farming, it does reveal how they lived. And there is a pretty good list of Elijah’s wardrobe. He had nine cotton shirts, four woolen shirts, three pairs of linen trousers, a pair of pantaloons, three pairs of woolen drawers (boxers), vests, one coat, a cloak, 15 pairs of stockings, two pairs of boots and one pair of shoes, two hats, two walking canes, and one silk handkerchief. I am not sure of the difference between trousers and pantaloons. This seems like lots of stockings and not enough handkerchiefs. Of course we can’t know the accuracy of an inventory from 150 years ago, and it does lists two separate lots of “old clothes,” which might balance things out. As to the contents of the house, the inventory includes only candles as the source of light. There are several bee hives and lots of honey on the list, so it’s no surprise that the candles were of beeswax. There was one stove for heating and one for cooking. Most of the cooking and dining utensils were not described in detail, but there were 15 blue plates and six silver teaspoons. Likewise, most of the furniture was not described, except for one cherry table. There were six fancy chairs and six “flag bottom” chairs, plus 12 old chairs. Elijah and Eunice had one looking glass, a Bible, and “a lot of books”, valued at 12 cents. This is “lot” as in a group, not many. There was the equipment for taking care of the clothing- a clothes basket, clothes horse (drying rack), wash tub, and irons, plus food storage- baskets and barrels, kegs, stone pots (stoneware), firkins, casks, and boxes. The house was carpeted to some extent, but it’s hard to tell how much as the list has “1 carpet the largest,” valued at $2.00 and “1 carpet the smallest,” valued at $3.25. The bedding in the house reflected the house when Elijah and Eunice’s children were home: several bedsteads, three feather beds, four straw ticks (alternative mattress, not as comfortable as feathers), plus 30 linen sheets, 17 woolen sheets, and 1 cotton sheet. I think Eunice must have enjoyed textiles, as the inventory includes a number of “coverlids”: two carpets, two blue and white, two red and white, and one black and white, plus three quilts and three comforters. The couple had just one horse and one heifer, and, interestingly, “one half of a 1 horse wagon.” Perhaps the wagon was shared with a son or daughter? There were just a few tools: a hoe and a bog hoe, a scythe, a cross cut saw, and an axe. As I said, they must have been mostly retired from farming, so perhaps there were more animals a few years earlier. Certainly Mrs Bryan must have had some chickens. Next let’s look at the inventory of Eliphel Gifford, widow of Caleb. She died in 1838 and is buried in St. John’s Lutheran Cemetery in Melrose. Caleb died in 1817, so she had been on her own for a long time. She had two cows, a boar and 12 sows, ten chickens- identified as “dunghill fowl”, and a pair of geese- kind of a basic set of animals for daily use. There was hay and corn to feed them. She had some potatoes, vinegar, “a lot of pork in the barrel,” apples, and “a lot of lard,” plus equipment to store and process food: stone jars, baskets, 13 milk pans, pails, iron pots, tubs, hogsheads, a cheese press- needed for making cheese, and three flour barrels. She had “a lot of soap”- indicating she made her own, as probably most farm wives did. Eliphel also had both a parlour stove, “one premium stove No. 3”, and a cookstove, plus lots of wood already cut. These stoves place her in the modern world- heating and cooking with stoves, rather than fireplaces. Her bakeware was made of tin, brass, and iron. She had five wooden bowls and two sugar boxes. There was no detailing of any special dishes or silverware, no mirror, no clock, no carpets, and just three books- a Bible and two others. We hope her children had already taken the furniture they wanted by the time the inventory was taken, as the furniture consisted of just one rocking chair, one stand, one table, one cot, one bedstead, one set of homemade curtains, and one lantern. There were no other lighting devices on the list. There were four cotton sheets, four pillow cases, two calico quilts, one comforter, and two flannel sheets. There was a separate listing of a bed and bedding, valued at $15, the highest valued items on the list outside the livestock. The appraisers made a list of the “wearing apparel of the dead:” five gowns, three short gowns, three petticoats, two check aprons, three pairs linen stockings, two pairs woolen stockings, nine handkerchiefs, a “bandbox hood ,” five caps, one pair of stays (a form of girdle/bra), one woolen shawl, one velvet cloak, five chemises, and one white cotton chemise. Again, one hopes her children had taken some of her clothes, as there are no shoes on this list, and some very old-fashioned garments- a set of stays, and chemises- which were like today’s slips with sleeves. The short gowns and petticoats would go together, the petticoats being outerwear and not underwear like today. Those are 18th century terms, however. It is possible that Eliphel, as an elderly lady, preferred to wear old fashioned clothes. I do not know what a “bandbox hood” might be, though there were 18th century hoods with interior hoops that might be stored in a bandbox- what we might call a hat box. The inventory of the estate of Alexander A. Miller, who died at age 27 in 1826, also lists his wearing apparel. This young man, who left a widow and small daughter, was a non-commissioned officer in the local infantry regiment in the New York State Militia. It seems from the inventory that he was a farmer, though it also lists a set of blacksmith tools. Except for a wagon, the most valuable thing in his estate was a cloak worth $40. His uniform cloak with epaulette was worth $20. He also had a sword, sash, and military hat, plus a feather- probably for the hat. He owned four pairs of pantaloons, three broadcloth coats, and a blue surtout coat (also called a frock coat, probably knee length), an old black silk vest, an old hat, two pairs of old shoes, and another cloak, this one worth $12, also seven shirts and six cravats (like ties), a pair of gloves and a pair of mittens, five pairs of socks and one pair of suspenders. Tantalizingly, he also owned a bass viol worth $8. He also had a silver watch, and two pocket books (like a wallet). Turning to the business side of the inventory, Alexander had five cows and one calf, seven old sheep and six lambs, eight shoats (young pigs) in the pen, 216 fowls, one mare and her colt. He had fifty loads of manure, ¾ ton of hay, 40 bushels of rye, a lot of potatoes in the ground, lots of wood and coal. The most interesting part of the inventory may be that Alexander had been in charge for the past two years of the “committee of the lunatic” which took care of George Miller, a lunatic. George evidently had an estate to pay for his care, but the estate hadn’t reimbursed Alexander for about $650 he had spent. This is a very large sum for the time. After a lot of research, I’ve concluded that George was Alexander’s father. Alexander’s untimely death must have caused even more than the usual grief and chaos. He left a young widow and child, plus the problem of who would take care of his mentally ill father. I’m sure he also left friends and family sad at the death of such a promising young father, citizen, musician, and farmer. So what can we conclude about life in Schaghticoke in 1840 from this admittedly limited sample? Farm families were as self-sufficient as possible. Inventories show equipment to process and store food, make candles, soap and other basics. Most farms had a variety of animals. Some women processed their own wool and flax at home. At the least they made their own clothes. Most families had stoves for cooking and heating, having advanced from fireplaces. Wealthier families had a few special pieces of furniture and glassware or dishes- for example a cherry table or a few silver spoons. Some of this material may have been heirlooms passed down in the family. While people had small wardrobes by our standards, they owned a few more clothes than families fifty years earlier. Most people had a mirror or two, perhaps a clock, and at least a few books. As to farm tools, most were basic- ploughs, wagons, drags, shovels, etc., but a few new items appeared: a fanning mill, for example. Men had blacksmith and logging tools. Farmers grew the feed for their animals and grain to grind for flour. Some farmers specialized, for example growing sheep for the local woolen mills or lots of poultry, presumably for the local market as well. Newcomb, John Bearse Genealogy of the Newcomb Family, Elgin, Ill, 1874. Transcript of the Records of the Schaghticoke Dutch Reformed Church, 1903. 1795-1868, pub. Munsell, Albany, 1868. Williams College; General Catalogue of the Non-Graduates, 1920. Williams College; General Catalogue of the Officers and Graduates of Williams College, 1910. Several years ago I began researching men with connections to Schaghticoke who served in the U.S. Civil War in honor of the 150th anniversary of that horrible conflict. Before I knew it, I had written 500 pages. This book is now available on the website of the town, somewhat awkwardly, but available. If you go to this link:http://townofschaghticoke.org/content/History and click on the first entry: The Civil War..the book will download in a couple of minutes. 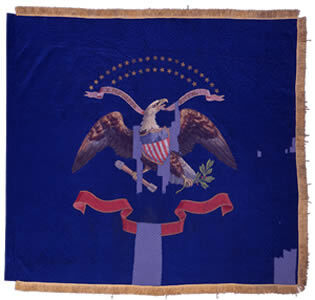 The first half talks of men who served in the 125th NY Volunteer Infantry Regiment. It was recruited in Rensselaer County, company K mostly in Schaghticoke. The second half deals with men who served in many other regiments. I have written brief biographies of each. They are listed alphabetically in each section, except that the 125th section begins with the officers, with an index at the end. This book does not have a bibliography. For the most part, I have listed the sources used within each biography. Much of the information came from the records of New York State, which are online at ancestry.com and the website of the New York State Military Museum. Then I used census, church and other records, both on ancestry.com and familysearch.org as well as in my own files, plus google searches. Sometimes I was able to find photographs. I only used those I had permission to use, or ones that were at the website of the Library of Congress or in general in the public realm. I have had a wonderful time doing this research, and now that I have declared the book “done”, I have a new source of information thanks to the re-enactment group- the 125th NY- which acquired photos of records in the National Archive. so I have a few more men to add. I know that I could find more info if I ordered the pension files of all of the men, but at $80 apiece, that was not possible for my budget. I hope some readers can learn new information about their ancestors through my research. That, along with honoring the men for their sacrifices, was my goal. By summer 1862 it was clear that the Civil War was not going to be over any time soon. It was also clear that many, many men were going to die in the fighting and that more troops were needed. The “Troy Times”, a daily newspaper in the city, had extensive daily updates on the progress of the war and more specifically on the movements of the 2nd New York Infantry, the Troy Regiment. It seems amazing to me that the 125th NYS Volunteers, the Rensselaer County regiment, was recruited and on its way to Virginia in only six weeks that summer. On July 17, an article entitled “Defend the Country, Uphold the Government” appeared. It advertised a patriotic rally to be held the next evening at the courthouse in Troy to begin the recruitment for another local regiment to enter the fight so that “the government may be upheld, the constitution vindicated, the country preserved, the rebellion crushed, and traitors defeated and punished.” Notice that abolishing slavery was not mentioned. That was not a stated goal of the war at the beginning. 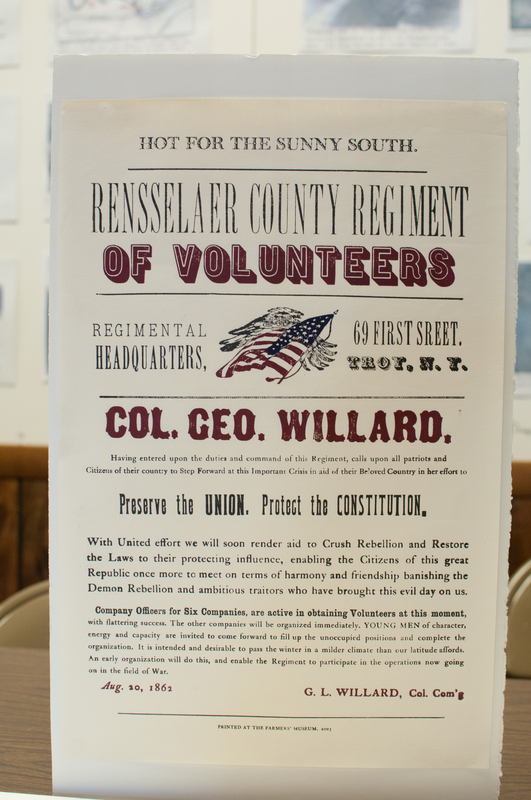 This reproduction of a recruiting poster for the 125th was printed at the Farmers Museum in Cooperstown. The sunny South? An article the next day called the rally “The Great War Meeting,” and reported that doubtless “the towns along the Troy and Boston Railroad will turn out very large delegations” as a special free train just for the purpose had left Petersburgh at 2. This train would have passed through Schaghticoke. And on July 19, the paper reported that 5000 men had attended the rally, so that there was one meeting inside the courthouse, of as many who could fit, and of the “quality” man, and another on the steps outside. Let’s imagine the scene: 5000 men, many young, of all sorts, from many parts of the county, on a hot July evening in the middle of the city of Troy, some jamming the un-air conditioned court house, others gathering around the steps outside, ready for a long evening of inspiring speeches. On August 5, President Lincoln announced a draft of 300,000 men for nine months. This pushed the recruitment of the local regiment ahead, as it offered bounties to enlistees, which would not go to draftees. About half the necessary 1000 men had been recruited at that point. Another resolution in the paper called for “a vigorous war ..to be waged on a bitter and relentless foe.” This was signed by prominent men of the area, including Amos Briggs, industrialist of Schaghticoke. A full company of 101 had been organized by August 15 in Schaghticoke and was headed for camp in Troy. That day the regiment received the designation as the 125th Also the paper reported that George Lamb Willard, who was already in the regular Army, had been released from his unit and would become the Colonel of the newly numbered regiment. Willard arrived in town on August 22. The paper began to speculate about the departure day of the regiment. . At this point the enlistees were to receive bounties from New York State and Rensselaer County, amounting to about $140, some payable upon enlistment, the rest after several months. In 1861 George Lamb Willard had worked hard to recruit the first Civil War regiment raised in Rensselaer County, the 2nd NY, expecting to become its Colonel. His picture illustrates this column. He was in the regular Army. He had risen to the officers’ ranks following his heroism in the Mexican-American War as a youth, and was a Captain by the time the Civil War began. An Army regulation forbad currently serving officers from transferring to the new volunteer regiments, so he was not allowed to lead the 2nd. By the time the 125th was being recruited in July and August of 1862, the regulation had been changed due to the lack of qualified officers as the numbers of men in the Union Army grew and grew. So just before the 125th shipped out, Willard arrived to become its commander. The “Troy Times” newspaper reported every step of his progress from his base in the Washington, DC area to Troy. George Willard had married a girl from Troy, Mary Gould Plum. She was the daughter of Elias Plum, wealthy leather merchant and bank president. They lived at 57 Second Street, now the home of the Rensselaer County Historical Society. The 1861 Troy City Directory lists George Willard as living there. As men throughout the county enlisted in the 125th, and the companies reached their complement of 100 men, the newspaper named the men appointed Captains of the various companies. They were lettered A-K, and each company was focused on a town in the county. 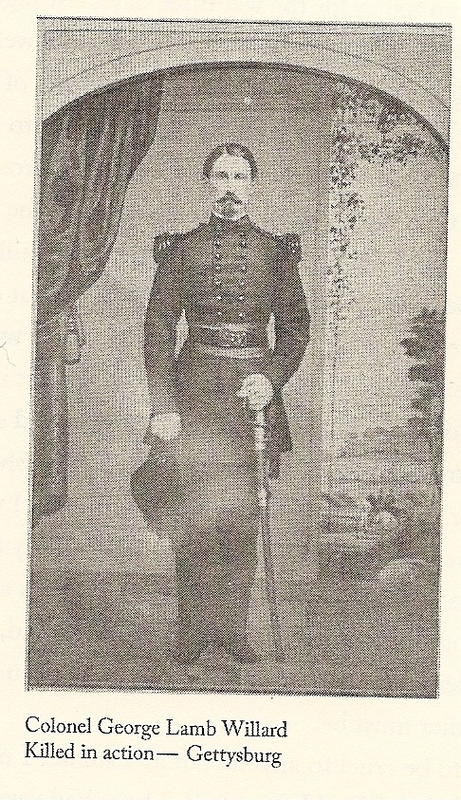 Captain John VW Vandenburgh, became the Captain of Company K of Schaghticoke. Charles A Picket became its 1st Lieutentant and McGregor Steele its 2nd Lieutenant. From my research, Captain Vandenburgh may have had experience as a New York National Guard officer before the war. I know very little about McGregor Steele, who was only in the unit until December of 1862, when he was discharged for unknown reasons. But Charles Picket was son of an entrepreneur in Schaghticoke named Lewis Picket. In the years before the War, father and son were melodeon manufacturers, and they started a paper mill after the war. Picket had no military experience as far as I know. The newspaper recorded that Picket’s friend William P Bliss presented him with a sword, sash, and belt, and David Myers a uniform on behalf of his friends of Schaghticoke. William Bliss was the President of the Schaghticoke Powder Mill and really a friend of Picket’s father. The sword he presented him survives, owned locally. Myers was a peer of Picket’s, and probably his friends took up a collection to purchase the uniform. The newspaper does report a couple of similar presentations of swords in the regiment, but not the extensive gift that Charles received. We can only speculate about the charisma of the young man who inspired such a gift and/or the patriotism and enthusiasm of the village of Schaghticoke to make such a splendid purchase. As August 1862 drew to a close, Companies A-K of the 125th NYS Volunteers filled up, 100 men each. Officers were appointed, Colonel Willard arrived. The “Troy Times” reported that its departure was expected any day. The men were mostly in tents in Camp Halleck, located near the Hudson River, at the junction of Glen and River Streets at what was then the north end of Troy. 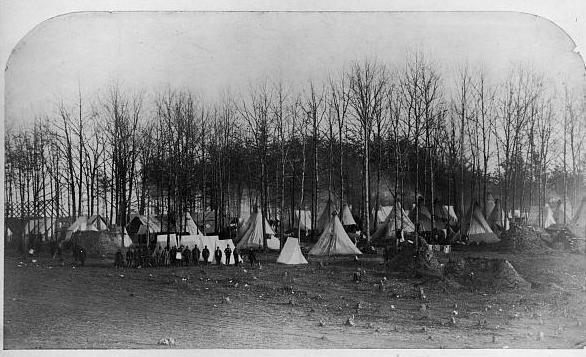 We can only imagine the scene at the camp- lots of young men away from home from the first time, confusion as to when the regiment would depart, outfitting with new uniforms and weapons, visits from relatives and friends. The camp wasn’t fenced off in any way and was fully accessible to the city. In camp about August 15, a member of Captain Vandenburgh’s company “accidentally shot himself in the hand.” The ball was extracted and the wound dressed. There was also a lot of marching around. On August 21 Captain Myer’s company marched through the city proceeded by Doring’s Band, which “furnished the usual good music.” After saluting the residences of Mayor Thorn, Hon. J.A. Griswold and others, “the company partook of a fine meal at the American House, Alderman Eddy being the generous host of the occasion.” The Saturday before, Captain Esmond’s company had paraded through Lansingburgh. A lot went into the outfitting a regiment of 1000 men to go to war. In October, the “Troy Times” gave this list: “a full requisition for a regiment calls for the following articles of clothing and equipment: 1015 great coats, 1015 trousers, 1015 blouses, 1015 bootees , 1015 caps, 1030 shirts, 4030 stockings, 2030 great coat straps, 1015 knapsacks, 1015 haversacks, 1015 canteens, 993 privates coats, 343 mess pans, 68 Sibley tents, 28 wall tents, 170 common tents, 1 hospital tent, 161 axes with handles, 161 hatchets with handles, 136 pickaxes with handles, 136 spades, 136 camp kettles, 20 bugles, 10 drums, 10 fifes, 10 camp colors, and 1 national color.” So everyone got a heavy coat, a pair of pants, what we would call a casual or fatigue coat, but they called a blouse, a shirt, a more formal uniform coat boots, a cap, two pairs of socks, a back pack to carry it all, a haversack to carry ammunition and a few small items needed in battle, and a canteen. The mess pans and kettles would be large enough for several men to cook together and the tents big enough for several to sleep together. About half of the men had to carry a digging tool or an axe. They would have to figure out their own bed and bedding. If we think for a minute about the men of Company K, the Schaghticoke boys, they would have been a mixture of farm boys and mill hands, with a couple of clerks thrown in, none with any military experience. Some had been enticed to enlist by the promise of adventure, others fired by patriotism, still others thrilled with the size of the bounty- more money in hand than they had ever seen before. Perhaps others were unsure what they wanted to do with their futures, and figured, why not? They had done a bit of drilling and marching in camp in Troy, but most had arrived there in mid-August, and they were at the front lines at Harpers Ferry, Virginia by early September, probably never having fired their weapons. Then the whole 125th Regiment met a horrible fate for men set out to fight the rebels and reunite their country: they were captured en masse when the post at Harper’s Ferry surrendered to the Confederates on September 15, without having fired a shot. The regiment was immediately paroled, as the Confederates had no way to imprison the 12,700 men in total who had surrendered. They were stationed at a parole camp, Camp Douglas, in Chicago for two months. Then they were declared exchanged and returned to Virginia. This was the largest surrender of Union soldiers during the war, but has been little written about. In part, I suppose Union historians didn’t want to examine such a major defeat. In part, a much more important battle, Antietam, with 26,000 casualties in one day, occurred just a couple of days later. Let’s look at this event which was so important to our local regiment more closely. General Robert E. Lee had achieved several victories through the summer of 1862, and was preparing to invade the North. 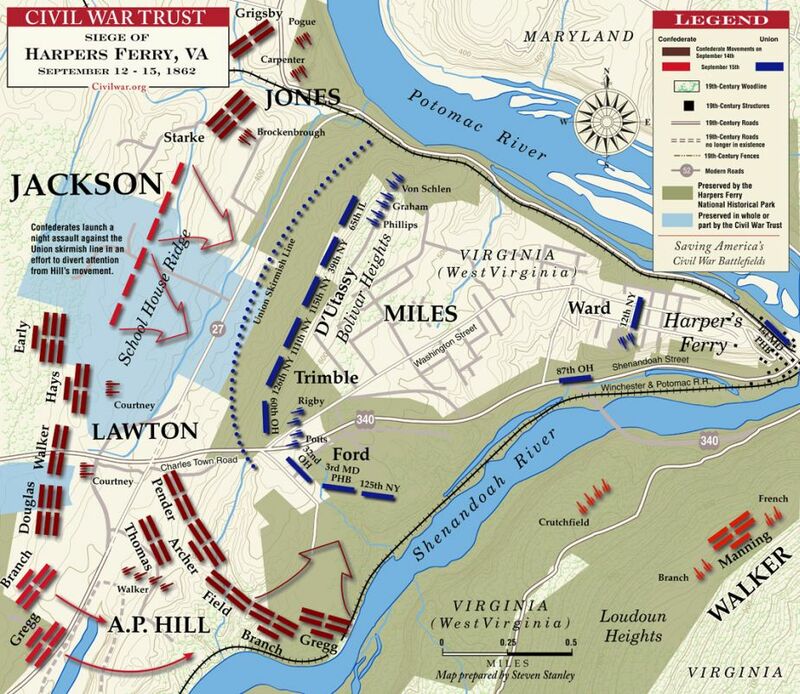 The Union garrison at Harpers Ferry, Virginia stood in his way. It would end up being in his rear as he advanced northward. 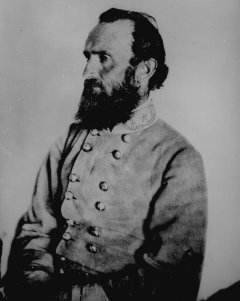 Stonewall Jackson was sent to take the post with 26,000 men. He conceived a complicated plan of dividing his army in three parts and surrounding the armory and supply depot on three mountains around it. According to Dennis E. Frye, chief historian at Harpers Ferry National Historical Park, Jackson succeeded brilliantly in surrounding the town, and began an artillery bombardment on September 15. 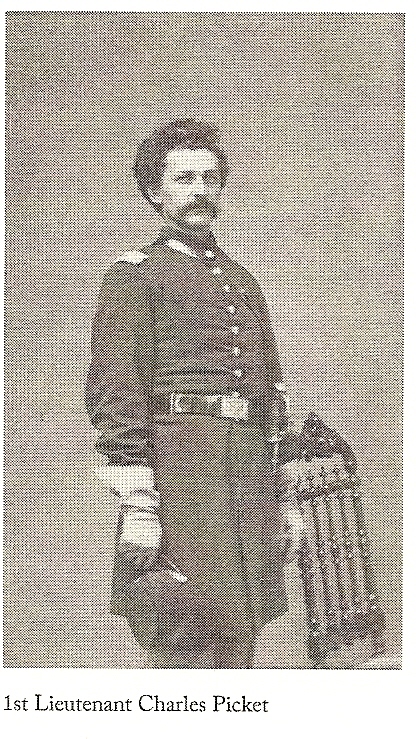 Colonel Dixon Miles, the Union Commander at Harpers Ferry, had orders from his superior, Major General John G. Wool, to “be energetic and active, and defend all places to the last extremity.” This is an important statement to us in Schaghticoke, as General Wool was raised here and had his home in Troy all of his life. But Miles and his advisors, facing annihilation by the Confederate artillery, surrendered the post on September 16. As Miles himself raised the white flag, he was hit by a piece of shrapnel and mortally wounded. Jackson captured 73 cannon, 200 wagons, about 13,000 rifles, and 12,700 prisoners, at the cost of 289 casualties: the biggest Confederate victory of the war. General Stonewall Jackson led the Army that surrounded Harpers Ferry. We are fortunate to have local views of the capture of Harpers Ferry. Joe Sticklemeyer found, edited, and published the letters of George Bryan of Company K, the Schaghticoke boys, written home to his friend Jennie Ackart. And the “Troy Daily Times” newspaper continued its comprehensive coverage. On September 8, the newspaper reported that Constable McManus and Chief of Police Barron of Troy had gone south with twenty men they had rounded up who had deserted from the 125th as it was leaving town the preceding week. They had many adventures, but finally reached the camp in Martinsburg, named Camp Wool,“leaving their friends on the eve of battle” and bringing home 100 letters from soldiers to friends and family. The next day the paper’s correspondent reported that “the enemy are appearing from every direction…if the Confederates march up the heights, Harpers Ferry will be at their mercy. What has the Union done to meet the crisis?” The correspondent was Axiel Ellis, who had worked for the paper and enlisted in the 125th. So it appears that ordinary soldiers were aware of the danger. Over the next few days, the paper was full of conflicting reports about events at Harpers Ferry. Often stories appearing on the first page of the paper would be contradicted on later pages, as the reporters updated events with new telegrams coming in. On September 15, the paper first stated that General Miles (actually Colonel) and all his command had been captured, “but it is only a rumor of the vaguest sort”, then that there had been no battle at Harpers Ferry. On September 16, the paper reported that the 125th had retreated from Martinsburg to Harpers Ferry, that there had been a battle at Harpers Ferry on Saturday and that Union troops had taken 6000 prisoners! And that Stonewall Jackson had been whipped in three battles. If only that had been true! After the battle, Axiel Ellis added that during that march from Martinsburg the inexperienced and untrained 125th had “suffered exceedingly” due to their heavy knapsacks, and most men had ended up throwing away “everything except their arms.” From conversations with National Park Service Rangers, I learned that the 125th was at one end of the Union line by September 14. Their location was on a steep side hill leading down to the railroad line, which ran along the Shenandoah River. It must have been frightening for the very inexperienced men from Rensselaer County to be so exposed, but they held their ground. The 126th NY Infantry Regiment broke and ran under the barrage, but with their experienced Colonel, George Willard, the 125th held. On September 21, the Times reported that several soldiers from the 125th had reached Troy with on-the-spot accounts. One dramatic story reported about the Regiment’s Colonel. “A round shot passed directly under Colonel Willard’s horse. He turned toward the battery from which the shot was fired, took off his hat as coolly as if on parade, and bowed to the enemy.” With an example like that, how could the men do otherwise than stay put! By September 17 the truth was reported, that the Union had surrendered Harpers Ferry and Colonel Miles had been killed. The September 19 issue gave a full story of the battle, adding that the white flag was “raised to prevent useless sacrifice of life,” but that the men were not happy about it, “a murmur of disapprobation ran along the whole line when it became known that we had surrendered, “though after the surrender, “soldiers on both sides set down to friendly conversation.” The reporter got to see the Confederate commander, Stonewall Jackson. He said “he was dressed in the coarsest kind of homespun, seedy and dirty at that, wore an old hat which any Northern beggar would consider an insult to offer him.” As to the Confederate troops, “the decayed appearance of the rebel soldiers…Ireland in her worst straits could present no parallel.” Also, the reporter was present when Colonel Miles died, and reported his extensive last words very dramatically. Lt. George Bryan wrote home to his friend Jennie Ackart in Schaghticoke. On September 25, George Bryan gave wrote his version home to his friend Jennie Ackart. “I suppose you have heard of our misfortune in being taken prisoners by the rebel Jackson’s army. You can judge yourself how I felt when I gave up my gun and equipment to the rebels. I had to march away amidst the cheers of the rebel forces.” George and the 125th were in camp on Sunday morning in Harpers Ferry when the Confederates “opened fire with six or seven batteries on us….they shelled us until dark…they shelled us three or four hours Monday morning” Then the army was surrendered. Bryan already had what became the prevailing opinion of the commander, Colonel Miles: “when the traitor Miles ran up the (white) flag….he was struck by a piece of shell and killed. He met his just reward. At one time the shot and shell flew all around our company, yet not one moved from his place…” Bryan was ready to fight and was deprived of the opportunity. The US government investigated the facts of the surrender just a couple of months later. They pulled in all the officers involved and questioned them. Colonel Willard testified that the 125th had arrived at Harpers Ferry on September 12. . The Confederate artillery batteries on Loudon Heights- across the Shenandoah River opened fire, and many troops retreated “in considerable disorder.” By September 14, they were located as I described above. There had been rumors that the soldiers didn’t have enough ammunition to fight, giving the General in charge, General Miles, further reason to surrender. Colonel Willard testified that they did have ammunition, but had not been given the opportunity to fire a shot. But he also said, “I felt we were in very desperate circumstances,” meaning they were surrounded. It was easy to blame the defeat on Miles, as he had been killed as he raised the white flag, but by September 15, the Army probably didn’t have many options left. The Times correspondent Ellis reported that the 125th marched 125 miles to Annapolis, Maryland after the surrender. “The regiment is at present somewhat discontented, dispirited and desirous of returning home until exchanged. The men are much opposed to being retained in camp or garrison.” Rumors swirled about what would become of them. One said that they would be sent to Chicago, another, more hopeful, that Governor Morgan of New York would make arrangements for them to go home. I’m sure that whoever was in charge felt that if the 125th were paroled to their homes, they would never return to the war. In Camp Douglas on October 16, he reported, “I have no place to sleep but on the ground.” It must have been getting chilly in Chicago in October. Bryan signed that letter as orderly sergeant, so he had already been promoted from his mustering in as a private. By November 2, 33 of the 100 men of Company K were sick, his and Jennie’s friend, Chauncey Crandall was in the hospital, and Ezra Burch had typhoid fever. He died a few days later. He was just the first to die. George wrote, “there is someone to blame from the many diseases of this camp…it is a sickly place around Chicago.” I’m sure that there was no intent to lose men to sickness and death due to bad conditions. Partly the system must have been overwhelmed by the sudden arrival of almost 13,000 men, and partly the sanitation of the time was just not what we have today. Morale was poor. Axiel Ellis reported that “a spirit bordering on mutiny has been manifested. George added that men were deserting as well. The company was down to 85. At least two of their officers were allowed furloughs. Captain Vandenburgh accompanied the body of Ezra Burch at least as far as Troy, and Lieutenant Steele had a twenty day furlough due to his ill health. Ordinary soldiers did not receive furloughs, however. How could there not be great frustration to just be sitting around- if they couldn’t go fight, why couldn’t they go home?! In my research into Company K of the 125th, I have found nine men who deserted in October in Chicago: Emery Beauchamp, Thomas Brand, Levi Buffett, Martin Roddy, James Scott, Joseph Slocum, and William Wolf deserted for good. William Martin returned to duty in May, 1863, presumably having spent the winter and spring at home, just in time to be wounded at Gettysburg in July. George Wolf also returned. In general, there just wasn’t sufficient manpower to search for men who went AWOL. And those who returned to duty were allowed to do so, perhaps with loss of pay as a penalty. I also found that musician Francis Hagadorn was discharged for disability in Chicago in March, 1863, long after the 125th had gone back to Virginia. He must have been in the hospital all that time. Josiah Slocum, an old soldier at 44, was also discharged for disability in Chicago, and David Johnson died in December in Chicago. On the bright side, George told Jennie he was “glad to hear that you have formed an aid society for the benefit of the soldiers.” Only a month or so after the 125th had shipped out, the folks at home were thinking of their welfare. On September 13th “Troy Times” printed a long, long list of items put together by the ladies of Hoosick to the Sanitary Commission, the organization formed to help supply the troops. The list ranged from $150 in cash to quarts of currant jelly, jars of pickles, clothing and fabric for hospital use, pillows, canned tomatoes and onions, woolen socks, bottles of wine, gallons of vinegar, dried fruit, and pairs of pants, stockings, and slippers. By the time George wrote to Jennie again, it was December 8th, 1862, and the address was “camp near Bullrun, Virginia.” The 125th had left Chicago by train on November 22, and “three days and four nights later” they were at Washington, DC. The 1000 man regiment was down to 675 men and 55 sick soldiers. Some soldiers were too sick to travel, including the “Troy Times” correspondent, Axiel Ellis, who died November 27 in Chicago, leaving a widow and two children. The regiment received supplies and tents, and then was moved around several times in the vicinity of Centerville, Virginia. Each time George told Jennie about the winterization of their camp, they would have to move again, “but such is the life of a soldier.” George finally received a box that Jennie had sent him on January 2, 1863. “My box had been opened and some of the things taken out. All that was left was the stockings and mittens and some apples and crackers and paper and envelopes…I was sorry when I read your letters and found that most of the things had been lost. Yet I am thankful for them. It is very pleasant to me to know that I have friends at home.” If that was what was left in the box, it must have been incredibly stuffed. The rations had improved since Chicago. “We have fresh beef once in five days and bread twice in five days; so we fare very well now.” For one supper, George described, “there is three of us in my tent…Fried some bread and meat together, it was kind of hash. We had bread and coffee to eat with it.” The men had to group together and cook for themselves- there was no Army mess as there is now. For heat in that winter, he said, “We get a pan of coals in our tents and we get seated around it. And can have merry times.” George was keeping busy studying for promotion. They were all waiting for spring and the campaign season to begin. In March, George reported he had been promoted to lieutenant and assigned to Company D, away from his friends in Company K. “At first I was quite lonesome, but now I am at home; I like the company.” There were raids by the Confederate cavalry quite frequently, and George spent many nights on picket duty. “I would much rather risk my life in battle than to be out so often all night in rainy weather…one is a slow death, the other honor or quick death.” Jennie must have asked if he was a Christian, as George replied, “I am far from being a Christian. I am sorry to have to say..” The lousy weather and strain of being on picket duty one night out of three were really wearing him down. He was eager to get going and participate in a decisive battle. Those who are familiar with the history of the Civil War will know what fight was coming……but I will deal with it this July. Stickelmyer, Joseph, ed., “Friend Jennie,” 2009. Herman Knickerbacker: Greatest Man Ever to Live in Schaghticoke?! I’ve written before about the most famous family in the history of Schaghticoke, the Knickerbackers. I will say again, if you haven’t visited the KnickerbockerMansion, you must! Look at their website: www.knickmansion.com for information on upcoming events. The Knickerbackers, Dutch from Albany, were among the first few European families to settle in Schaghticoke in 1708. In the next generation, John or Johannes Knickerbacker was Colonel of the local militia regiment in the Revolutionary War. His son John was among the ten wealthiest residents of town in 1800. It was John’s son Herman, who knew author Washington Irving. Irving made Knickerbacker into an iconic name, a symbol of being a New Yorker. Herman or Harman Knickerbacker or Knickerbocker was born on July 20, 1779. He was the sixth child of fourteen of John Knickerbacker, Jr. and Elizabeth Winne. Three of the children, including an earlier Herman, born in 1770, did not survive childhood. Herman had three brothers, William, John, and Abraham. Perhaps because Herman would not be the principal heir, or perhaps because he just was more ambitious or more academically inclined than his brothers, Herman studied to be a lawyer. Of course, John, a wealthy man, could afford to have his son be a student rather than go right to work. Herman was a child of privilege. According to one of his obituaries, Herman studied law with John V. Henry in Albany and John Bird in Troy. Both were important men. John V. Henry was the son of a merchant in Albany. Born in 1767, he was admitted to the bar in 1791. In 1800 he became Comptroller of New York State and was later the state Attorney General. John Bird, born in Litchfield, Connecticut in 1768, was a graduate of Yale, who came to Troy in 1793- very early in its history. He was a Federalist, elected to the U.S. House of Representatives in 1799. Herman had two powerful mentors in these men. He also became a Federalist, and jumped into politics even as he was admitted to the bar in 1803. As an ambitious young man, Herman leapt into many things at once. Though he lived in Schaghticoke, Herman had his own law firm in Albany, in partnership with Job Pierson. Job was a newcomer to Schaghticoke, and a graduate of WilliamsCollege. He completed his training to become a lawyer in Herman’s office in 1815. They were partners until 1835. Knickerbacker was appointed a Captain in a new troop of cavalry in the local militia in 1801. Fellow residents Bethel Mather and John Vanderspiegel were appointed Lieutenants. Mather lived where the M & T Bank is in Schaghticoke now, and Vanderspiegel was the founder of Speigletown, the southern section of the town of Schaghticoke. . Continuing his military career, in 1810, Herman was appointed Major in the 3rd Regiment of Cavalry. An item in the “Troy Post” of October 15, 1816, announces the annual review of the squadron of cavalry of RensselaerCounty at Lansingburgh on October 17 at 10 o’clock in the forenoon by order of H. Knickerbacker, commandant. Herman must have been an excellent horseman. So now Herman had a career as a lawyer and entrée into his community as a leader in the militia. This portrait, courtesy of the New York Historical Society, shows Herman Knickerbacker as a young man. Doesn’t he look confident? Herman became a trustee of the new Presbyterian Church in Schaghticoke in 1806, soon after its founding in 1803. He was chosen at a meeting of the church’s founders at the home of Bethel Mather, with whom he was also in the militia. Pews in the newly constructed meeting house were sold in 1820. This was how the building was financed. Herman bought pew 35 for $35 and pew 36 for $36. A couple of other men bought two pews, but Herman’s was one of the higher monetary totals. His law partner Job Pierson also bought a pew. Perhaps this religious involvement was somewhat politically motivated, as none of Herman’s children was baptized in the Presbyterian Church. Even two children born after the pew purchase were baptized in the old-line Dutch Reformed Church. Herman also entered politics. He served as Supervisor of the town of Schaghticoke for the first time from 1805-1806. He also served in 1813, from 1818-1823, and from 1825-1826. Knickerbacker reached what turned out to be the pinnacle of his political career when he was elected to the U.S. House of Representatives in 1809. He followed his mentor Bird by only eight years, and directly followed another town resident, Josiah Masters. Like them, he was a Federalist. At the time the major political issue of the day was the coming War of 1812. The Federalists opposed the war. President Thomas Jefferson and the U.S. Congress imposed an embargo on U.S. trade with Great Britain in 1807. The embargo devastated the economy, though it did encourage the development of domestic industry. According to an 1833 newspaper article, Herman’s maiden speech in the House was against the continuance of the Embargo. He spoke of the negative effects of the embargo on the citizens of Schaghticoke. 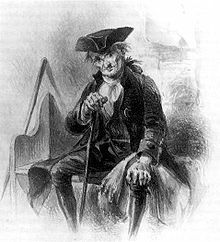 “It is said that he painted the suffering of his constituents so pathetically, and with such a masterly hand, that he threw the House of Representatives into convulsions of laughter.” Herman only served one term in Congress. It seems that many people today serve for many terms in Congress, but during this period, it was common for a Congressman to serve just one term. After his time in Washington, Herman continued to be very active in politics. In the “Troy Post” in 1813, there was an advertisement for the “Assembly Peace Ticket”. The Federal Republicans (Federalists) of RensselaerCounty met to nominate men to run for the N.Y.S. Assembly. Bethel Mather of Schaghticoke was one of the nominees, and Herman Knickerbacker was the secretary of the group. They called for “Peace, Liberty, and Commerce.” Herman continued in this role. In 1815, with the war over, the Federalists ran a long campaign ad, listing the many debts incurred and taxes imposed by the Republican government during the war, with nothing to show for it in the peace treaty ending it, and encouraging all to vote for the Federalist ticket. Herman served one term in the New York State Legislature in 1816, winning by a considerable margin over his Republican foe. There was a controversy over seating one of the legislators of the opposite party in a disputed election. Herman participated in a walk-out with other Federalists over the affair, saying “it was our duty; when we perceived that reason and argument were impotent to withstand the lust for office and the madness of faction.” This sounds like something that could happen today! Throughout, he was an active attorney, farmer, and industrialist. Basically every early 19th century deed or will of a person in Schaghticoke which I have examined has Herman’s name in it somewhere- either as a creditor or a lawyer. For example, while examining the probate papers of Andrew Diver, a well-off local man who died in 1809, I found that Herman Knickerbacker was the attorney. When Josiah Masters, the local man who had served in Congress just before Herman, died in 1822, Knickerbacker was the administrator of the estate. I have found two deeds where bankrupt people sold their land to Knickerbacker and partners, unable to pay back loans to them. They would have to sell the land to recoup their loans. In 1828 William and Olive Slocum of Schaghticoke sold all their real and personal estate to Herman and a couple of others to satisfy their debts. Knickerbacker had endorsed several of Slocum’s promissory notes, which Slocum was now unable to pay, and had been awarded a judgment of about $5000 in Supreme Court. 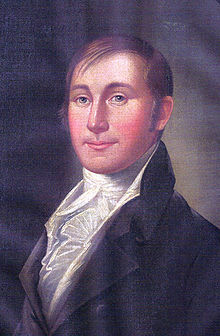 In 1811, Knickerbacker became the President of the Farmers Manufacturing Company, incorporated at Schaghticoke Point (the village of Schaghticoke) to make “woolen, cotton and linen goods, and for making glass and from ore bar-iron, anchors, mill irons, steel, nail, rods, hoop iron, and ironmongery, sheet lead, shot, white lead, and red lead.” The trustees were Jonathan Mosher, Aaron Bemus, Ebenezer Deval, Harmon Groesbeck, and Joel Tallmadge. Richard P. Hart took over as President by 1819, and it became part of his huge mill holdings in the gorge of the HoosicRiver. It was one of the earliest industrial ventures trying to take advantage of the power of the HoosicRiver, and Herman got in at the start. Perhaps it was a case of the investors wanting a prominent person as President, and Herman, just finishing a term as U.S. Congressman, would have been that. But as will be seen later, Herman had other mill ventures. Herman’s father, John, died in 1827. He left 1,166 acres around the KnickerbockerMansion, divided into three farms. William, the eldest son, had the first choice, and sons John and Abraham inherited the other two. Abraham ended up with the 332 acre home farm and the mansion. Herman inherited “Gailord’s land”, and the rights to a mill that his grandfather had had. An 1826 codicil left Herman a farm that had belonged to James VanAntwerp. One of these pieces of land may have been where he actually lived on the Tomahannock Creek. Law partner Job Pierson lived nearby. Besides his involvement in beginning a mill on the Hoosic River, Herman constructed mills himself, located near his home on the Tomahannock Creek, just to the east of where it crosses Route 40. An 1833 newspaper article reports that Knickerbacker “resides about a mile south of the village at the Point, on a singularly wild and romantic spot, upon the bank of Tomahnnock Creek. His ample brick mansion Knickerbacker embosomed in a grove, which he planted with his own hands, forty years ago. ..Below his mansion, Judge K has a number of mills, and likewise a Satinet Manufactory, all his own. He oversees these works himself, and likewise cultivates several extensive and very rich and beautiful farms.” (Satinet was an imitation satin, made of cotton.) To develop the mills, he would have had to construct a dam and its associated water courses. An 1839 deed records Herman selling some land on the Tomhannock to a principal in the Powder Mill. It discusses water rights, noting that Herman gave the buyer the right to use 1/3 of the water from HIS dam, and that he, Knickerbacker, was responsible for maintaining the dam. So you can see that Knickerbacker was involved in all aspects of his community, and indeed his county and state. But he was also a very busy and involved family man. He married his first wife, Arietta Lansing in 1801. She was a daughter of Abraham Lansing and Else VanRensselaer of Albany. Thus Herman married into two of the most prominent Albany families. They had five children before her death in 1814. They had four children baptized in the Schaghticoke Dutch Reformed Church: Abraham Lansing, born in 1802, with godparents Abraham and Elsie Lansing Jr.; Elizabeth Maria, born in 1805; Catharine, born 1808; and Rebecca, born in 1813. The 1810 census of Schaghticoke lists H. Knickerbacker with a family of 2 males, 3 females, and 4 slaves. Arietta died in April 1814. Herman married Rachel Wendell in December. He needed a mother for those five small children. Rachel was the daughter of John H. Wendell and Catherine VanBenthuysen of Albany. Wendell had been an officer in the Revolution, called “General” in later life, though he had not really achieved that rank. He was a prominent attorney who served in the N.Y.S. Assembly and as Albany County surrogate, treasurer, and justice of the peace. I find it interesting that Herman again married a girl from a well-known Albany family rather than from Schaghticoke. Herman would assuredly have known a fellow member of the bar in Albany. He and Rachel had five more children. Daughter Arietta was born in November 1815. Cathalina Wendell, born in 1817 had her grandfather Wendell as godfather. Daughter Maria VanVeghten was born in 1819, son John in 1821, and daughter Rachel Jane in 1822. All were baptized in the Dutch Reformed Church in Schaghticoke. Now there were three sons and seven daughters. At a time when public education was just becoming established, and many girls received little or no education, Herman aspired to more for his daughters. Four of his daughters by first wife Arietta attended the Troy Female Seminary, now EmmaWillard School. Elizabeth attended Emma Willard’s first school in Waterford in 1820. 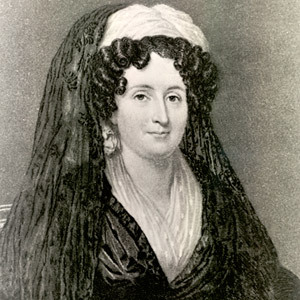 Emma Willard was a pioneer in education for women. Elsie attended her Troy Seminary in 1822, Catharine in 1824-1825, and Rebecca in 1828. Arietta, a daughter of Herman and second wife Rachel, attended from 1830-1832. Herman Knickerbacker sent his daughters to be educated by Emma Hart Willard at her groundbreaking school in Troy. The 1820 census lists Herman with a family of 1 male between 16 and 18, 1 between 16 and 26, 4 females under 10, 3 from 10-15, and 1 female slave from 26-44 years of age. Just a note on slaves: Slavery was gradually abolished in New YorkState, beginning in 1799. Blacks born after that date would be free after a certain number of years, with all to be free in 1827. A second note: Herman may have lived in a house near his brothers at this point, as they all appear on the same page of the census. Herman’s second wife died in 1823. He married a third time on July 20, 1826, to Mary Delia Buel, at her church in Troy. She was the daughter of attorney David Buel and Rachel McNeil of Troy. Mary Delia was born in Litchfield, Conn., the seventh child of her parents. They had moved to the new city of Troy in 1798. Interestingly, one of Mary’s sisters was the second wife of Herman’s mentor, John Bird. Again, Herman would have known his father-in-law before the marriage through the bar association. In the 1830 census, Herman had a family of 1 male under 5, 1 20-29, 1 30-39; 2 females under 5, 2 from 5-9, 1 from 15-19, 3 from 20-29, and 1 from 30-39. He was 51, his wife in her 30’s. Herman and Mary had four children of their own, two boys and two girls: Sarah Bird, Charlotte, David, born 1833, and Herman. I don’t know where they were baptized. Herman and Mary’s daughters also attended the Troy Seminary: Sarah Bird from 1841-1844 and Charlotte Buel from 1846-1848. Sarah continued there as an assistant after graduation and until her marriage. Herman had a total of fourteen children. Eleven survived childhood, just three of them boys: Abraham, the eldest child, born in 1802, and David Buel, and Herman, children of his third wife. David and Herman had uncles younger than they were, children of Abraham. Herman continued to live in a houseful of young people. In the 1840 census, he had a family of 2 males from 5-9, 1male 15-19, 1male 20-29, and 1 female under 5, 1 female 10-14, 1 female 15-19, and 1 female 30-39. By 1850, this activity was winding down. The 1850 census lists “Harman” a farmer aged 73, with an estate of $6,000, his wife Mary B., age 53, daughter Charlotte, age 18, and two servants, Ann Hopkins, age 30, who was Irish, and Eve Wolf, age 50. The other children were all off on their own. 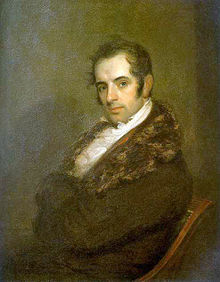 Portrait of Washington Irving by John Wesley Jarvis, 1809. He used Herman Knickerbacker as his inspiration for Diedrich Knickerbocker. Herman’s official Congressional Biography also notes his hospitality and generosity. However, none of the sources mention that Herman was involved in a large number of business and legal affairs in his community. As I noted earlier, basically every will or deed I have looked at from about 1810 to 1830 includes Herman in some way. He was the lawyer, the administrator of the estate, the lender of money, the partner of others in some legal wheeling and dealing. Knickerbacker’s influence may also be seen in the fact that his neighbors Hannah and Peter Grant named a son born in 1810 Herman Knickerbacker Grant. Herman died January 30, 1855 in Williamsburgh, New York City, at the home of his daughter Sarah Bird Knickerbacker and her husband Reverend Samuel Haskins. His wife Mary had died at Sarah’s home just a few weeks earlier, on December 6, 1854. His obituary notes that he suffered paralysis soon after his wife’s death and “gradually failed” up to the date of his death. Sarah herself died later that same year in Saratoga, where she had gone for her health. While Mary was buried in OakwoodCemetery, where there was already a Buel family plot, Herman was interred in the KnickerbackerCemetery, across the street from the Mansion, next to his first two wives. There has been some speculation that a rift between the couple may have been responsible for this separation, but given that the couple was cared for in the same child’s home until death, I feel this is unlikely. Perhaps finances were more the reason, or perhaps Mary’s relatives thought she should be with her own family, rather than in a row with Herman’s first two wives. A lengthy obituary for Herman appeared in the Troy “Times” on February 2, 1855. There were few obituaries in the newspaper in that era, so this was a sign of Herman’s importance. And the obituary could not have been more laudatory. The Rensselaer County Bar Association held a special meeting to mourn Knickerbacker. Long-time law partner Job Pierson chaired the meeting and began by saying that for the first twenty years of their partnership, he and Herman had been political opponents, “yet never during that time did we ever entertain personally an unkind feeling the one to the other. During all his life time never had, indeed could not have had a personal enemy. His kindness was his only fault.” Others went on to note he was “an honorable and honest man in all the walks of life.” General Viele said “a more benevolent and philanthropic could scarce ever beamed upon oppressed and struggling humanity.” The paper added that “the quaint stories and laughable anecdotes of which the Judge is the hero are almost innumerable.” The bar association voted to wear mourning badges in his honor for thirty days. Ironically for a lawyer and judge, Herman died without a will. But there is a probate file connected with sorting out his estate. The file notes that Herman died with eleven grown children and no widow. David and Herman, sons by Herman’s third wife, were administrators of the estate, along with Clarence Buel, who may have been a brother-in-law, and M.C. VanBuskirk. It does seem that Herman Knickerbacker was a generous man, perhaps too generous. Former law partner Job Pierson stated in his funeral speech that “it was his misfortune through life to risk his credit for his friends until at length …at the close of life he was robbed of that affluence which ….had enabled him to entertain his friends with princely magnificence.” The Surrogate placed notices in the local papers calling any creditors to come forward. Herman’s estate was inventoried and its contents had to be sold at a public auction and a private sale in February 1855, so that expenses of the estate could be paid. The public sale brought $620. The real estate brought $2,350. Funeral expenses were about $110, including $40 for a modest tombstone, paid to grandson John Hale Knickerbocker; $27.50 for a mahogany coffin; and $7 to Reverend Roberts, who officiated at the funeral. Son David received $507 to cover his expenses, and the attorney got $90. Old law partner Job Pierson received about $110, from an old dispute, and physician Ezekiel Baker, $55. A closer examination of the inventory shows a library of about 150 volumes, including biographies of famous people, such as Jefferson and Washington, 17 volumes of Shakespeare, and an 8-volume history of England. The most valuable piece of furniture was a marble mantle clock valued at $10. Possible proof of the entertaining Knickerbacker did is seen in the total of 83 chairs of different types in the inventory! How many chairs do you have in your house? I would love to see the “old Dutch Clock” listed, worth $2, or the several “pictures” and “paintings,” or the mahogany cradle worth $3. Was that clock a family heirloom? There was also a teapot, sugar, and creamer valued at $20, the largest single sum on the list, and a wide variety of other household belongings. There was little in the way of farm implements, and no farm products (except for a ton of hay) or animals. Evidently that had been sold or given away earlier. There were several vehicles: a lumber wagon, two cutters (sleighs), and one “covered carriage” valued at $15. All in all, this seems a paltry estate for such a prominent man. It also seems sad that there wasn’t a will, where there could have been personal bequests to his many children. Perhaps he took care of that in life, giving mementos and financing to his children as they grew up and moved away. Let me add a note on a couple of Herman’s sons. Abraham, born in 1802, is listed in the 1850 census as a farmer with an estate of $15,000. He and his (second) wife Mary had two sons living at home. John Hale, age 21, was listed as a student, and son Henry, 17, as a farmer. Mother-in-law Mary Hale lived in the home, along with one Irish farm hand, one black laborer, and two Irish serving girls. Jon Stevens of Easton, the absolute expert on Knickerbockers, says that Abraham had also been involved with his father in manufacturing. Herman’s son David Buel, born in 1833 and older than nephew John Hale, attended TrinityCollege in Hartford, Connecticut, then the General Theological Seminary in New York City. Perhaps he was at school when his father died in 1855. The next year, David went to the new town of Minneapolis, Minnesota, population 300, as a missionary. He remained there for 27 years, and then became the 3rd Protestant Episcopal Bishop of Indiana. He died in 1894. Looking back, though Herman lived a full life, and was a credit to his community, his much greater legacy is as the inspiration for Washington Irving’s Diedrich Knickerbocker, and as the source for the use of “Knickerbocker” as a symbol of a New Yorker. “Annals of Albany, 1850-1856” p. 316. “Emma Willard and her Pupils”, ed. By Mrs. Fairbanks, 1898. The Industrial Revolution in the new United States was based on use of water power and improvement of transportation. There had been a few mills in Schaghticoke prior to 1800, saw and grist mills on the Deep Kill and Tomhannock Creeks. They produced products for local consumption. The construction of the first bridge across the river at what is now the village of Schaghticoke around 1790 made possible the exploitation of the tremendous water power of the 100-foot falls there. I have already written of the construction of the Northern Turnpike in about 1800, another part of the transportation component of industrialization. But access to those falls was critical to future development. According to Beth Kloppott in her “History of Schaghticoke”, William Chase built the bridge over the Hoosic in 1788, and turned it over to New York State in 1792 in exchange for 12,000 acres of land north of the Mohawk River. The map of the Corporation Lands at Schaghticoke- the portion of town owned by the City of Albany in the vicinity of the Knickerbocker Mansion, has “Chase’s Bridge” labeled. William Chase appears in the 1790 census of the town with a family of six males aged 16 and over, seven females, and one slave. In 1794 town records show that Chase was reimbursed 59 pounds for repairs to the bridge. A new bridge was already needed by 1799. By that time, William Chase had moved on. He does not appear in the 1800 census. New York State authorized a company made up of John Knickerbacker, Bethel Mather, Charles Joy, Silas Weeks, John Travis, and Zephaniah Russell to build the bridge and collect tolls for 25 years, after which the state would take over. These local men were probably interested in the tolls, but perhaps more in the industrial development made possible by the bridge. While Knickerbocker and Mather were primarily farmers, Charles Joy was an immigrant from Boston who would soon build a textile mill on the Hoosic. After 1800, the factory system grew throughout the U.S., with larger and larger numbers of employees working in a central building, using machines operated by water power, rather than individual craftsmen working at home or in small shops. New England entrepreneurs moved into Schaghticoke, eager to develop factories using the water power of the Hoosic. Gradually, manufacture of woolen and linen cloth moved from the home to a central factory building. The village of Schaghticoke began to grow, as people moved into town to work in the mills. They needed places to live and shop. By 1813, Spafford’s “Gazetteer” said the town of Schaghticoke had twelve grain mills, eleven saw mills, one oil mill, one fulling mill, two carding machines, one cotton, and one linen mill. While some of the grain and saw mills were on other streams in town, the rest of the mills were on the Hoosic at the new village of Schaghticoke Point. According to Sylvester’s History of Rensselaer County, Charles and Benjamin Joy of Boston constructed the first mills at ‘Schaghticoke Point”: a carding machine (which would card wool, preparing it for spinning), a grist mill, and a saw mill. Charles was one of the group who financed the construction of the second bridge over the river in 1799. The saw mill still survived in 1850, when Lewis Pickett built a paper mill on the spot. The paper mill was across the street from where Agway is now. Joy’s Schaghticoke Linen Mills, founded about 1800, were just downstream. They manufactured duck, a heavy canvas fabric. The site later became the Cable Flax Mills, which I will discuss in future posts. 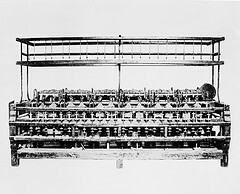 Another candidate for the first mill at Schaghticoke is a fulling mill, which would have finished the woolen fabric woven on home-based looms. A 1798 advertisement in the “Troy Northern Budget” states that Edward Hart “has taken the fulling mill at Schaghticoke Point,” which would indicate her had purchased an already-existing business. 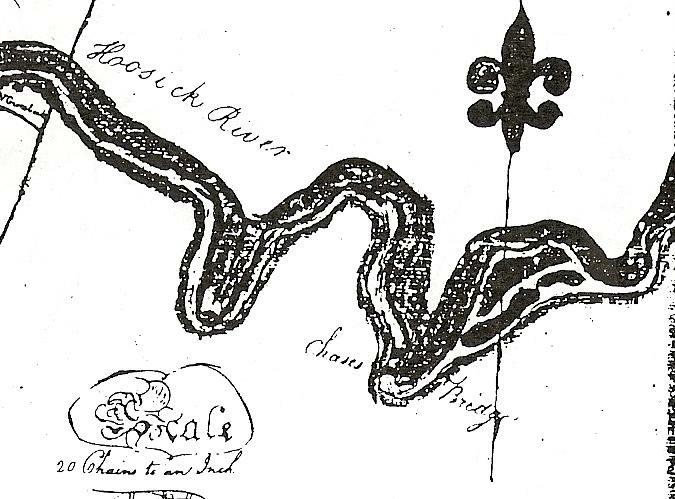 Sylvester also states that there was a machine shop “perhaps as early as 1800” on the south side of the river, west of Route 40, owned by George Brown and his son-in-law Giles Slocum. This later became a cotton factory owned by Ephraim Congdon, then a twine factory. The cotton factory burned and a new twine factory was built on the site. Brown and Congdon negotiated over the sale of the land, water rights, and the right to build a dam- necessary to create the vital water power. Brown sold land and water rights to the Starr Manufacturing Company, incorporated in 1814, which manufactured woolen, cotton, and linen goods. A relic of that company is the “Star Hole”, a depression in the Hoosic River under the bridge at Schaghticoke, jumped into to cool off in summer by generations of local teenagers. Further downstream on the south side was a cotton factory, built by Waddell and Shephard about 1816, which operated about twenty years before it burned. Sylvester goes on to say that at one time there was a plan to develop the water power slightly downstream from that, at Buck’s Neck, creating a chain of factories, but that the dam necessary for the project was washed away in an unexpected flood of the river, and never rebuilt. None of the companies discussed in this paragraph was successful in the long term, but the owners continued to reinvest and build anew. this photo is taken from down stream- and really shows the falls on the Hoosic River at Schaghticoke. Ray Seymour found it for me. The Rensselaer Woolen and Cotton Manufacturing Company was downstream from an early flax mill, on the north side of the river. It was incorporated at Schaghticoke Point in 1810 for the purpose of manufacturing “woolen, cotton, and linen goods, and for making glass, and from ore, bar iron, anchors, mill-irons, steel, nail rods, hoop iron, (and other iron goods)”. From the list, it seems the goal was to use the products of the farmers and provide them with metal goods they might need. It owned land on the river which it rented to smaller companies. The first directors of the Company were James Brookins, James Cornell, Munson Smith, Leonard Cozzens, and Charles Starbuck. Brookins, whom I will write more about in other posts, was an officer in the Green Mountain Boys during the Revolutionary War, who moved here in 1793. He was also an original commissioner in the Northern Turnpike Company of 1801. Smith appears in the 1800 census, but not Cornell, Cozzens, or Starbuck, who were newcomers to town. The company advertised in “The Troy Post”, seeking raw wool to be exchanged for finished wool cloth, and for “six or seven good families, who would engage several out of each family to be employed in the Manufactory.” These families would receive housing, courtesy of the mill. Presumably, the mill would buy its wool locally, but would have to import the cotton. The company struggled. In 1812 and 1816 New York State lent the company money. In 1814, it advertised the sale of some of its cotton spinning machinery: “new cotton machinery for sale. 4 new throssel frames, containing 60 spindles each, and 2 mules of 180 spindles, apply to Messrs. Richard P. Hart and Co. Troy or at Schaghticoke Point where the machinery can be seen. Erastus Skinner, agent for the Rensselaer. Woolen and Cotton Mfr Co.” There must have been other machinery, because on August 22, 1815, the company advertised “wanted 3 or 4 journeymen clothiers at the Rensselaer. Woolen and Cotton Mfg Co, Schaghticoke Point, Erastus Skinner agent.” On August 25, 1815, it advertised “Manufacturers and Clothiers take notice: in May last there was a piece of broadcloth partly dressed left with us to be finished which we have reason to believe was stolen. Any person proving property and paying charges can have it by calling on Erastus Skinner, Agent.” One wonders what story the person told who brought this length of fabric to be finished, and why the factory came to believe it was processing stolen goods! It’s also interesting to know that the factory processed fabric woven elsewhere- presumably of home manufacture. In 1816, the agent tried to settle some of the unfinished business of the company. On October 8, he advertised: “Notice: all persons indebted to Renselaer Woolen and Cotton Mfg requested to call and settle their accounts by 1st of November. All remaining unsettled at that time will be put in proper hands for collection. Also all persons having yarn in their hands to weave or cloth wove are requested to return the yarn or cloth without delay as the business must all be closed.” The second part of this ad gives another indication that at least some of the cloth was being woven in private homes, then brought to the mill for finishing. I think that the reference to the business being “closed”, just means that the accounts needed to be settled. As is true now, much business was done on credit. I must quote another fascinating ad from agent Erastus Skinner in the “Troy Post” of January 7, 1817.”$ 30 Dollars Reward/ Stolen from the tenter bars in the Dry House of the Rensselaer Woolen and Cotton Mfg Co on Saturday night December 28: 3 pieces of cloth: 1 piece black broad cloth about 25 yards fulled, napped, and not sheared; 1 piece mixed Kerseymere about 24 yards, cotton warp, fulled and partly dressed; 1 piece country cloth black about 6 yards, fulled and partly dressed. Whoever will return the whole shall receive $20 reward or in proportion to what is returned and $10 for lodging the thief in the gaol of the county and all reasonable charges paid.” Broadcloth can be either woolen or cotton. Kerseymere, a term first used in 1793, was a fine woolen cloth with a twill weave, though in this case, the warp was cotton. 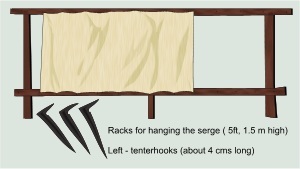 We also learn that the factory had a special building where the cloth would be spread out to dry on tenter bars. One wonders who would steal cloth that was not finished, and if the thief was caught. In 1819 the company was ordered sold to cover its debt. The factory burned in 1821, but it was rebuilt by two men who would figure prominently in the continuing industrial development of Schaghticoke, Amos Briggs of Schaghticoke and Richard Hart of Troy. While the Hoosic River was the primary location of mills in Schaghticoke, the water power of the Tomhannock Creek, which crosses Route 40 at the settlement of Schaghticoke Hill, was also used by industry. On the northwest side of the stream where the bridge crosses on Route 40, there was a grist mill, operated by the Evans family. Sylvester’s history states there was a saw mill and turning factory of George Burton nearby as well. Just downstream was the complex known as “Knickerbocker’s Mills”, site of textile works. Sylvester states there was a mill there as early as 1800. I have found that Herman Knickerbocker ran a “Satinet” factory there around 1830. Yet further downstream is the original location of the Schaghticoke Powder Mills, founded about 1812 by the Masters brothers. I will write further about both Herman Knickerbocker and the Masters and the Powder Mill in future posts as the stories are long ones. Continuing on downstream on the Tomhannock Creek, there are three waterfalls- Sylvester says two, but I have visited all three. Buttermilk Falls, just upstream from the bridge on Buttermilk Falls Road, is the most visible of the falls. According to Sylvester, there used to be a grist mill and a very early bellows factory somewhere in the vicinity of that falls or the one just below it, which is visible to the west of the road, especially in the winter. Sylvester states that construction of the railroad created new water power in the area, and that Elisha Brownell built a dam and a paper mill to take advantage of it in 1852, but that the mill burned after just a few years of operation. Farther downstream, near the current Denison Farm, is supposed to be the site of the first grist mill built north of Albany,around 1707, on a small stream which runs into the Tomhannock. William Pitt Button, who owned the farm when Sylvester’s history was written in 1880, built a small dam at the same site to churn butter for the family. Still farther downstream, Anthony Button built a flax mill around 1875. Mills were also built on the Deep Kill, the stream which crosses Route 40 in Grant’s Hollow. From 1819-1912, the Deep Kill was the southern boundary of the town of Schaghticoke. Michael Cook, founder of Cooksboro and a Revolutionary War veteran, had a grist mill on the Deep Kill, which formed the southeasternmost boundary of the town. The next mills on the stream were at what is now called Grant’s Hollow, mills to produce agricultural machinery, first constructed about 1836 by Issac T. Grant. I will write about Mr. Grant in future posts, as his is a fascinating and lengthystory. Further downstream on the Deep Kill toward the Hudson, there were just a few saw mills. Mill construction continued in Schaghticoke throughout the 19th century, sometimes in what to us would seem surprising locations, considering the meager flow of the streams. I will discuss these mills in future columns. The early 19th century industrialization transformed the town from a purely agricultural area to a booming site of industry. The village of Schaghticoke grew quickly, and agriculture began to be focused on producing products for the textile, grist, and saw mills. Retail businesses sprang up to serve the new residents, who were both locals and new immigrants, first from New England, then from Ireland, and Scotland, come to find jobs. Schools developed to serve the children of the incomers, as did a variety of churches. Schaghticoke left its colonial past behind.